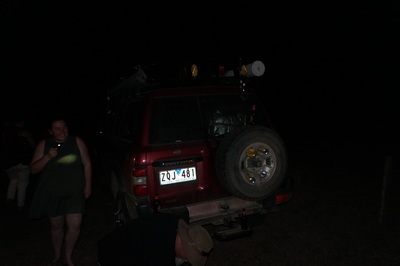 It was almost 3am as the old taxi slowly pulled away from the curb. 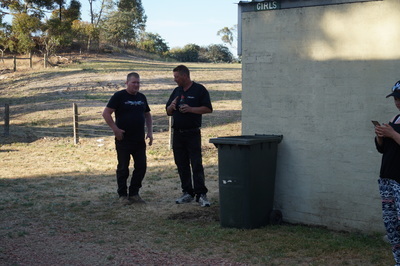 As I walked back around the side of the Clubhouse, I stopped and looked. 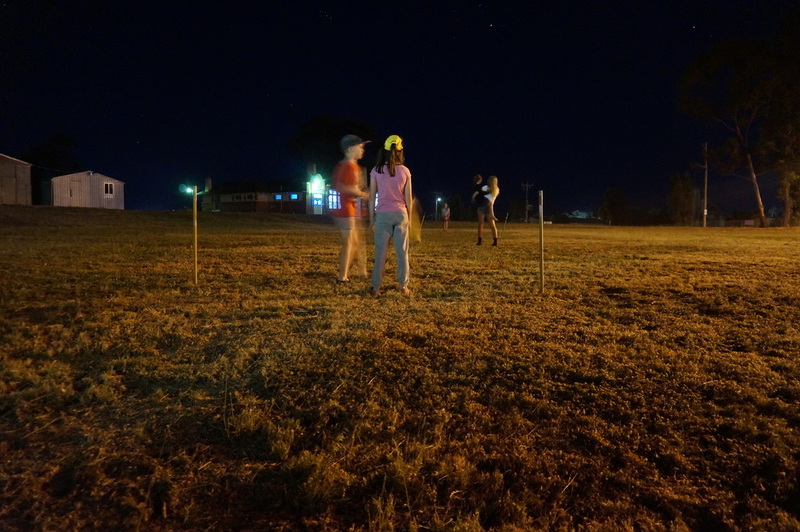 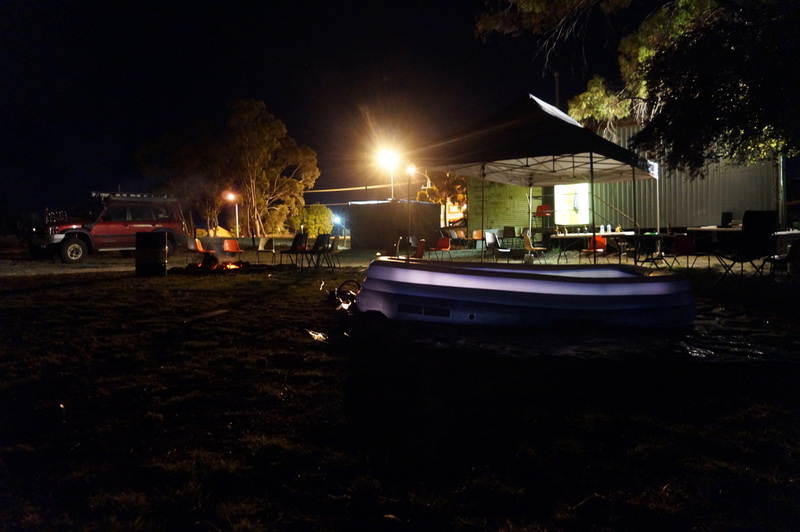 Earlier in the day it had been quite hot, but by now the sun was long gone, the stars were shining and a chill was descending over the yard. 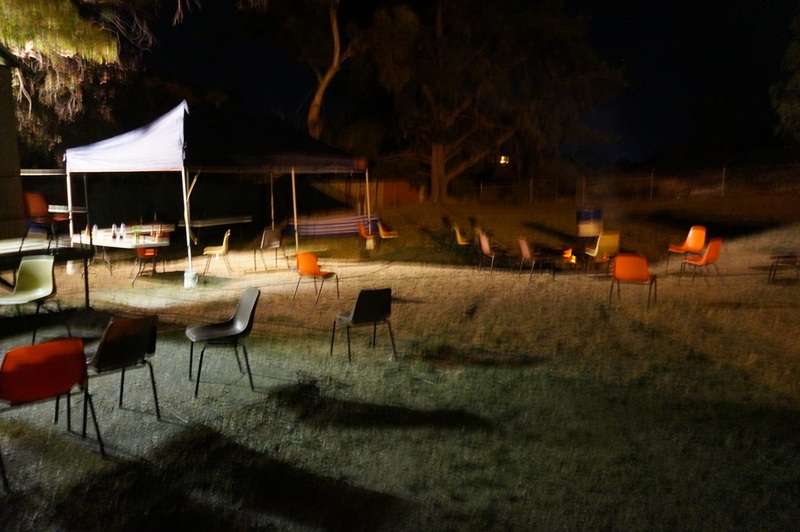 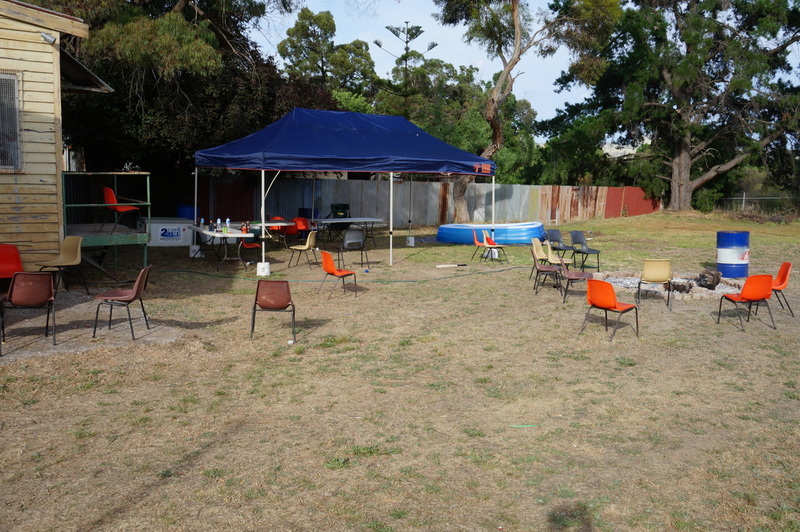 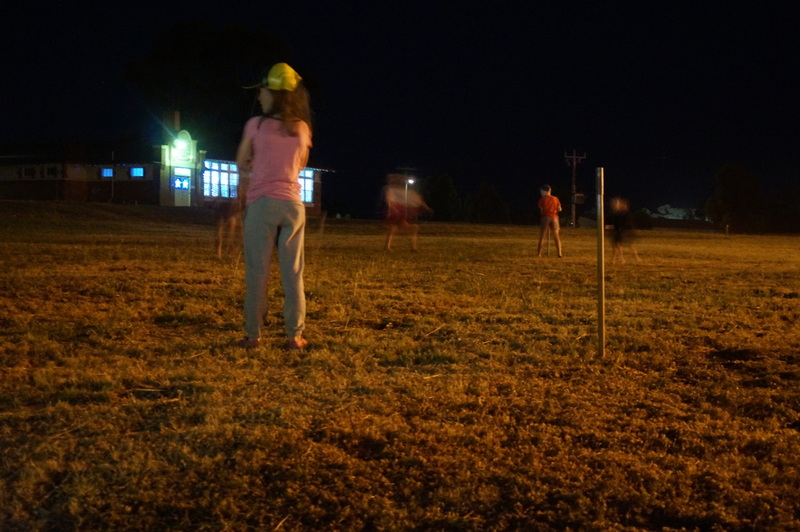 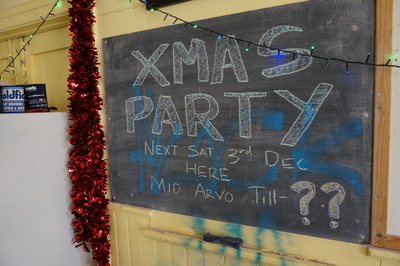 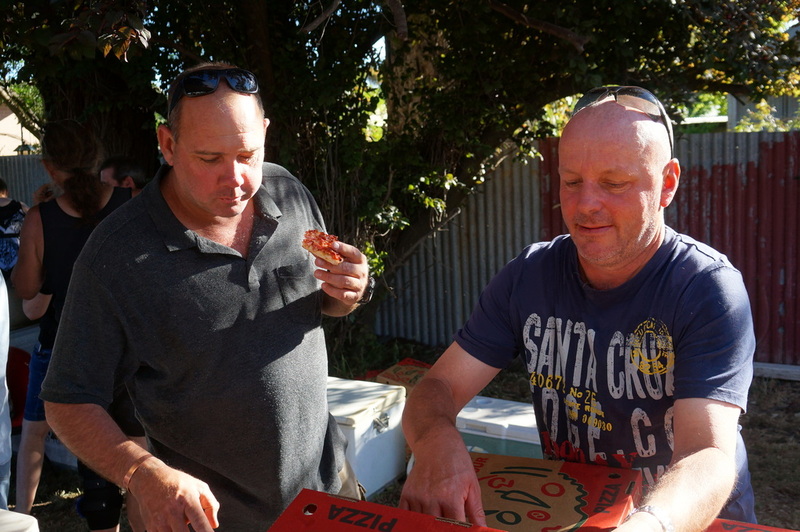 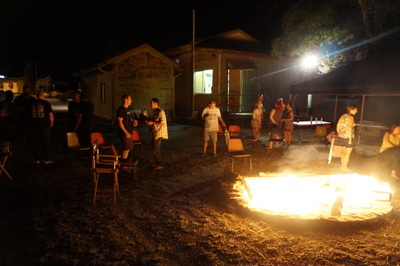 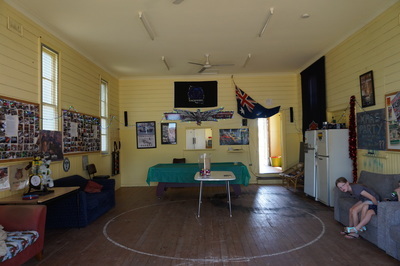 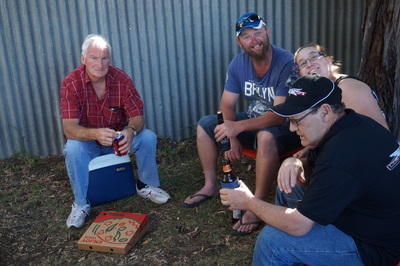 I looked at the empty chairs, the empty pizza boxes, and the empty stubbies. 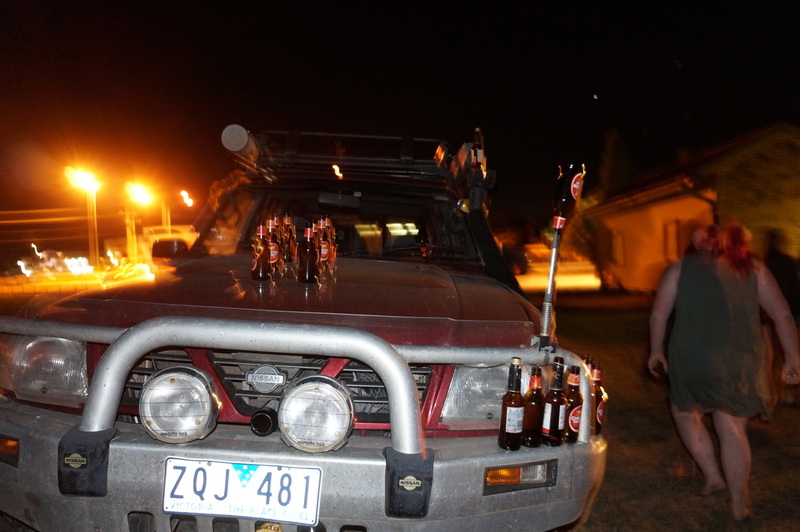 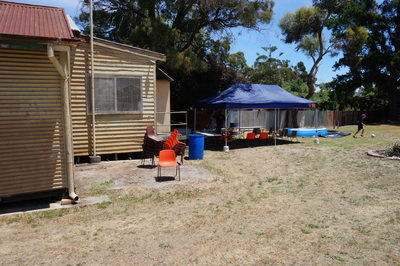 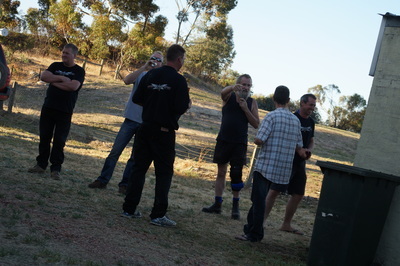 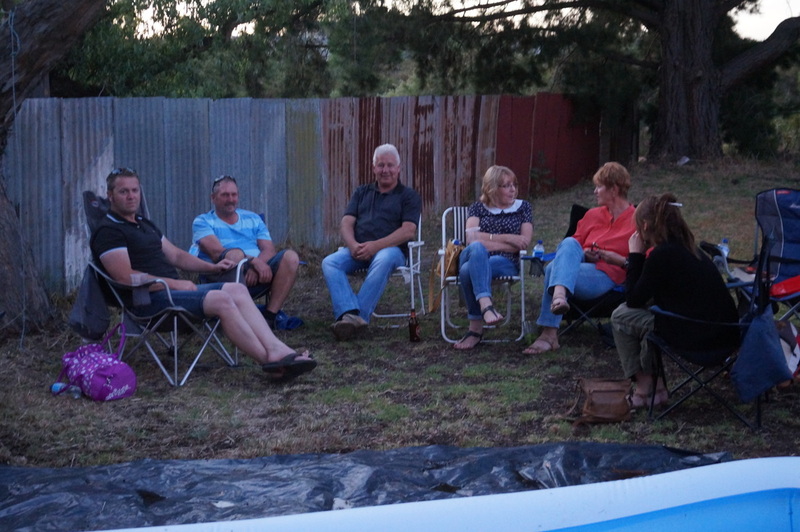 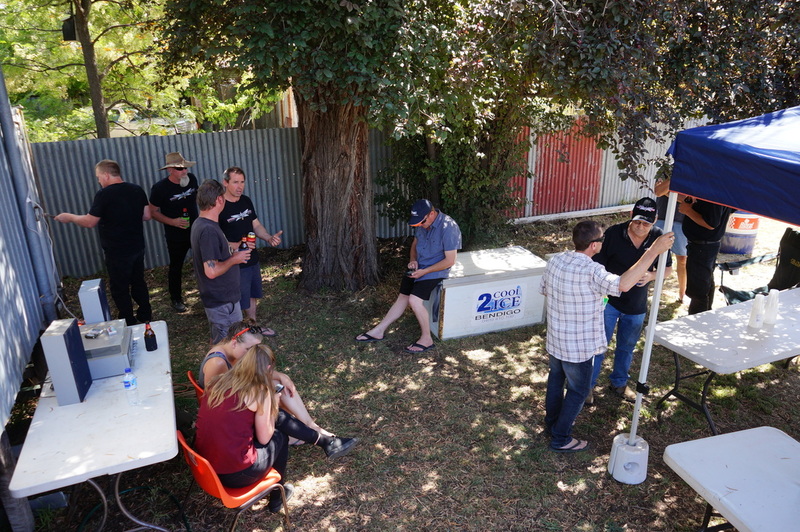 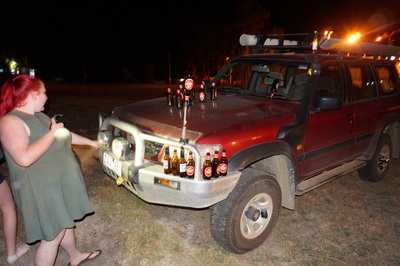 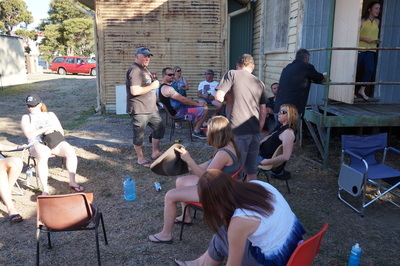 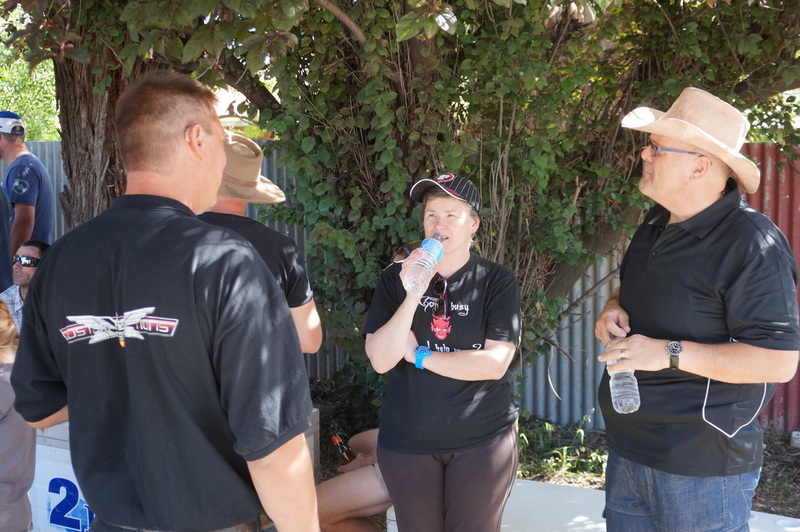 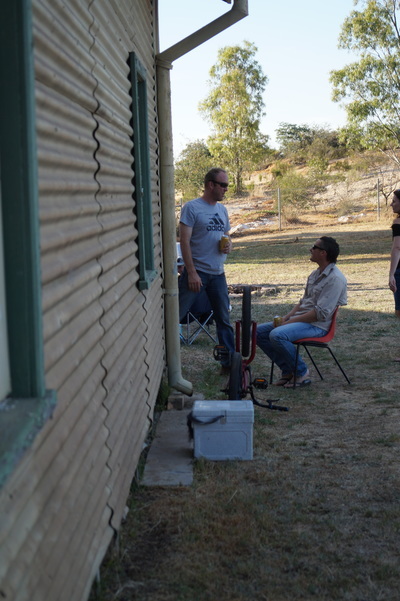 I opened up the esky and twisted the top off a draught stubby, savouring the icy brew. 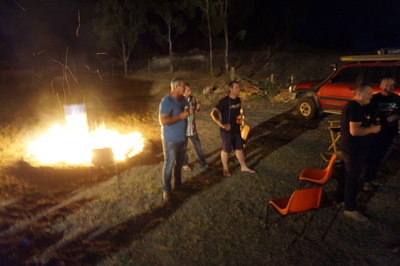 Staring at the glow from what was left of the fire, I listened to the only sound that could be heard. 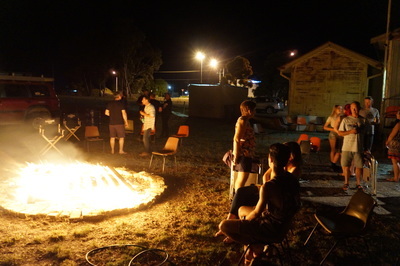 The quiet crackle of the dying embers. The last club members had gone and the eerie silence that had been slowly creeping over the Clubhouse was now complete. Not sure what time Kim and Dean had begun preparations, but when I arrived there at 12:30 they had the cool room full of beer and ice, the gazebo up, the tables and chairs set up, the pool slowly filling with water, and had already cracked their first beers. Well done guys. 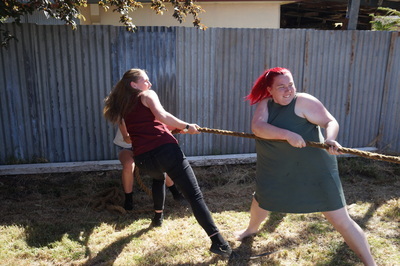 You make it easy for the rest of us. 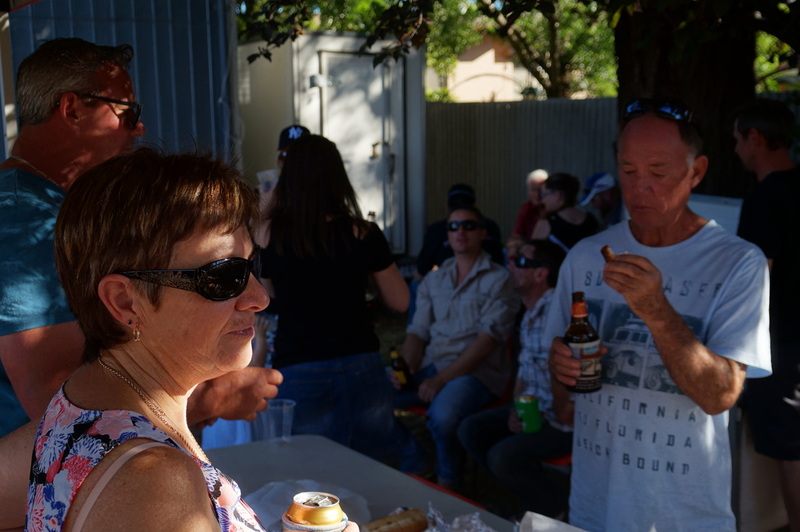 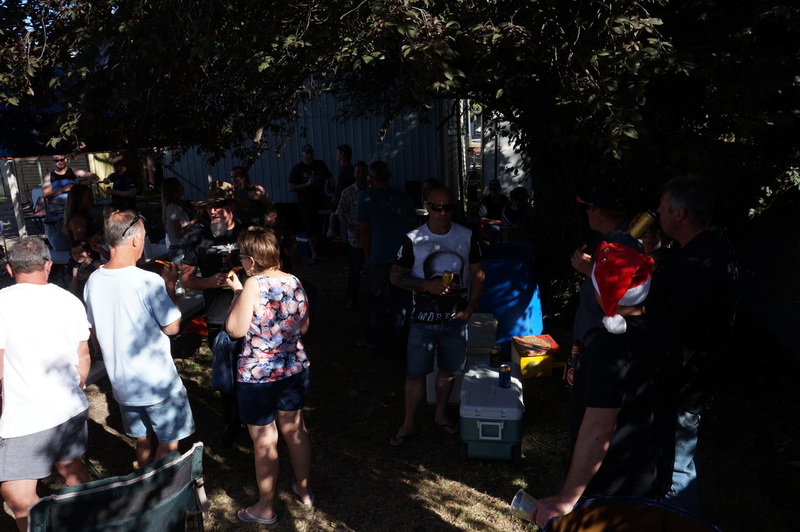 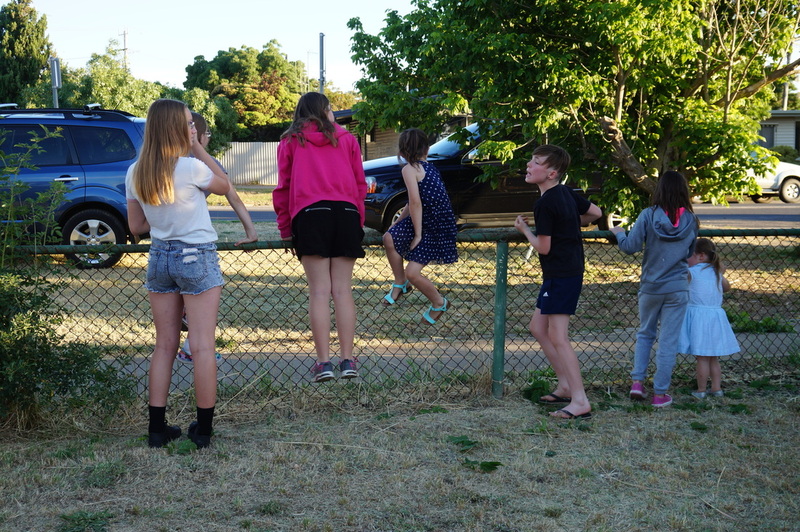 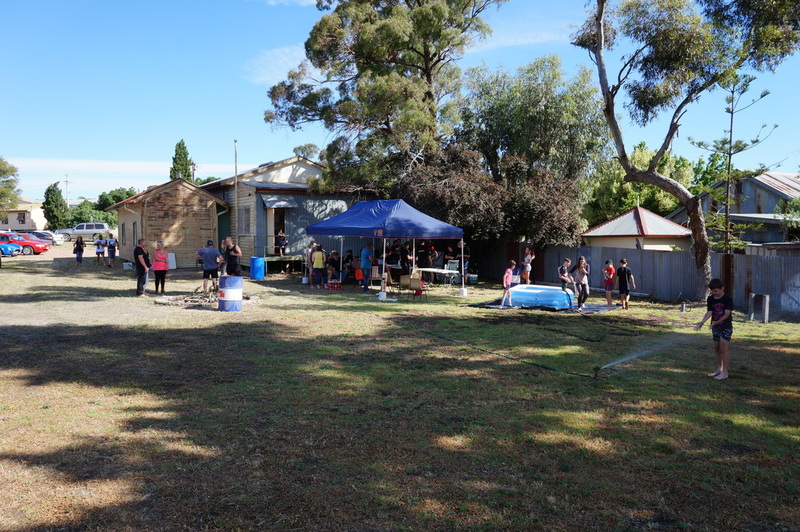 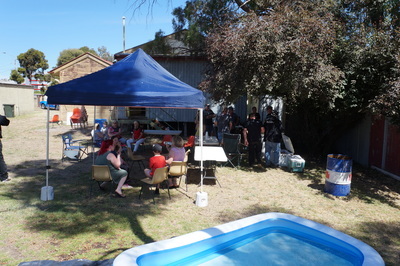 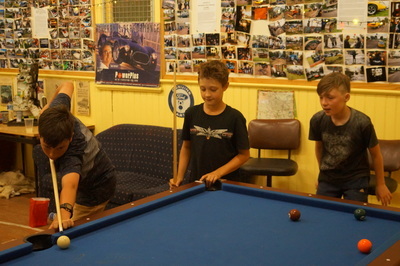 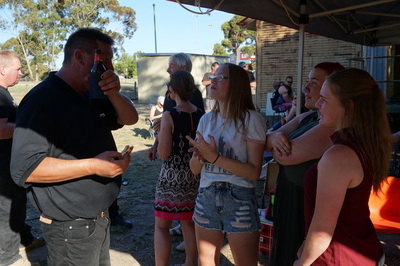 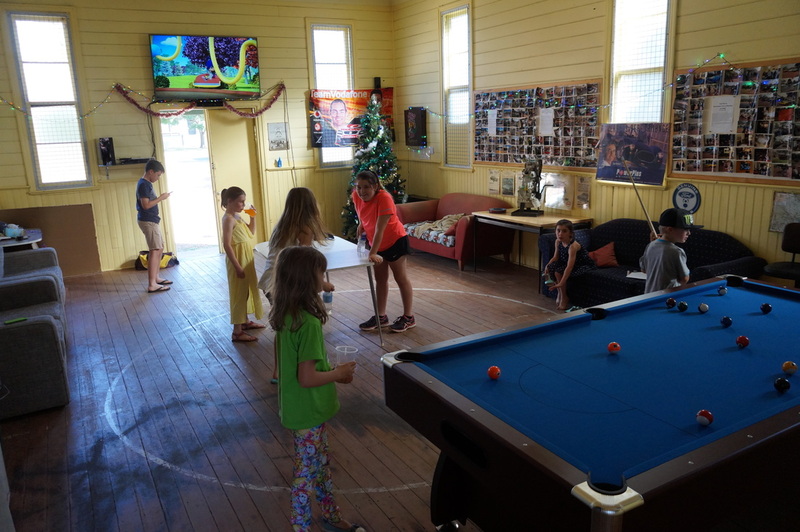 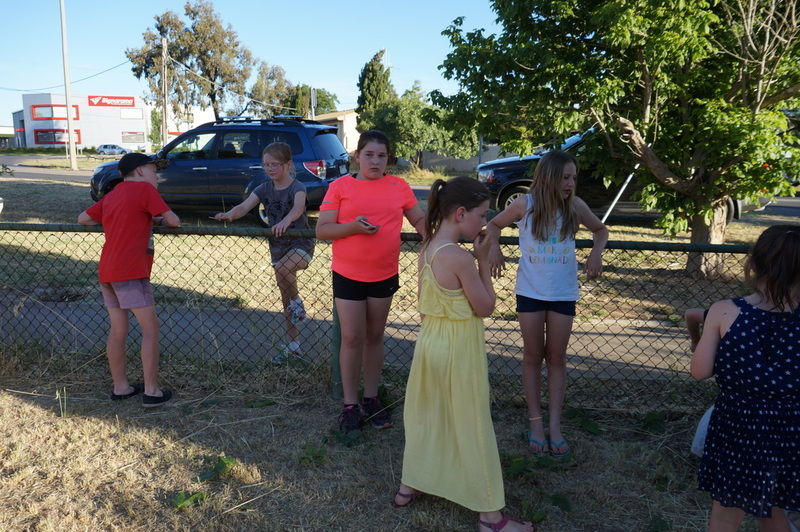 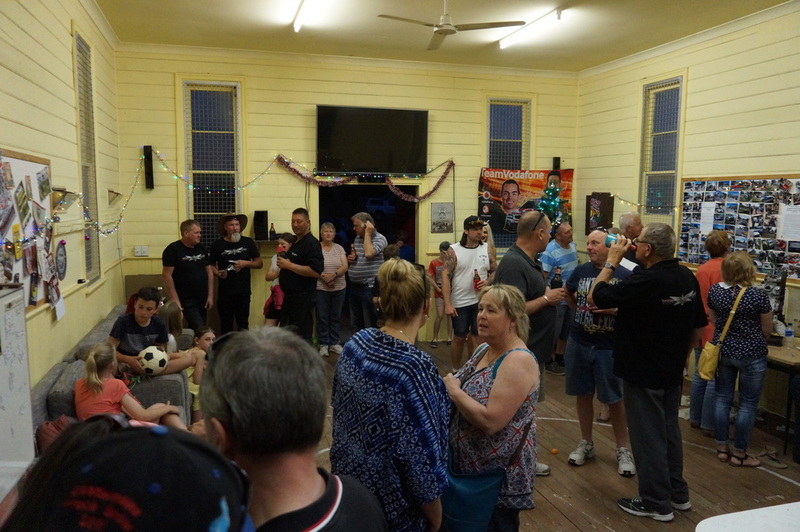 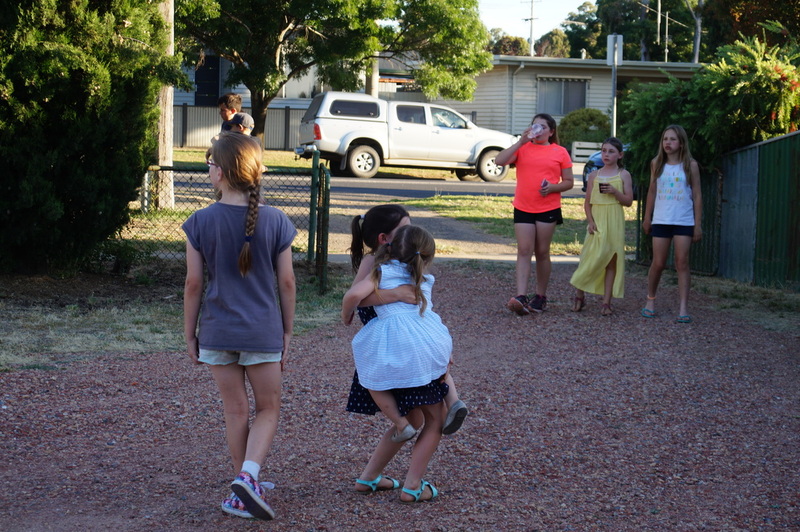 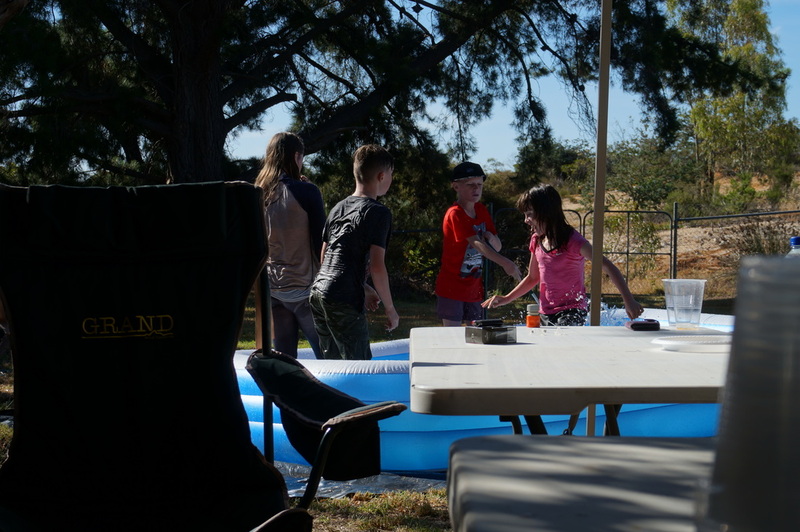 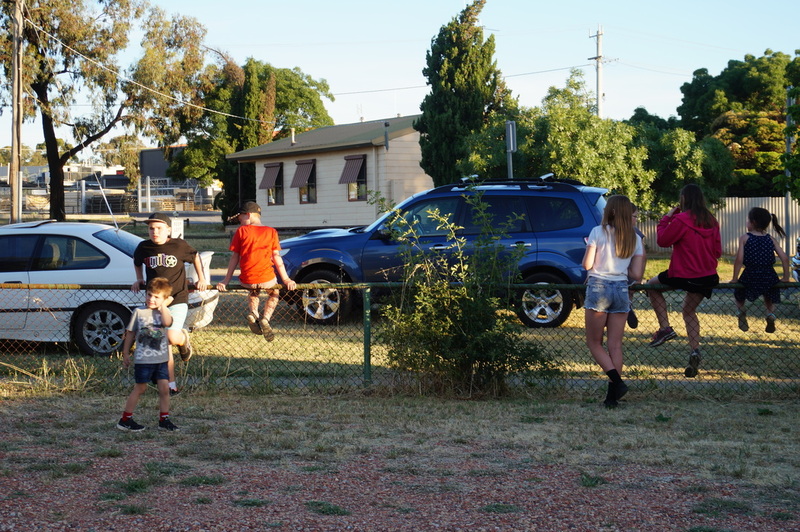 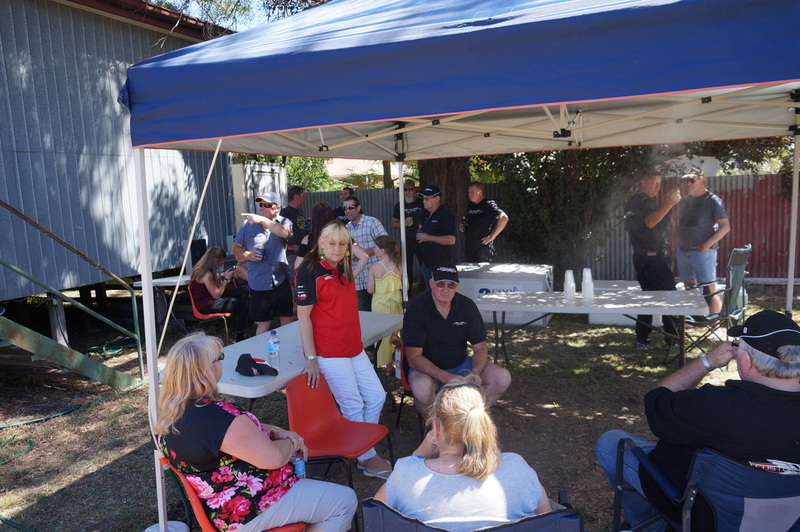 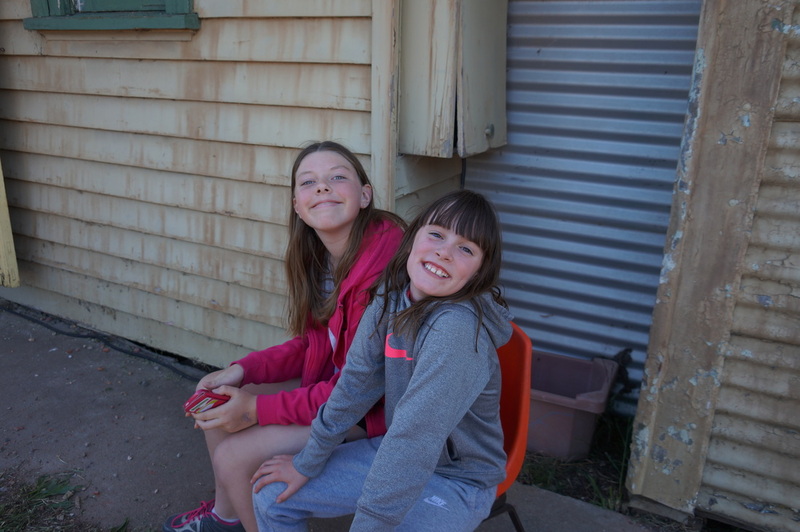 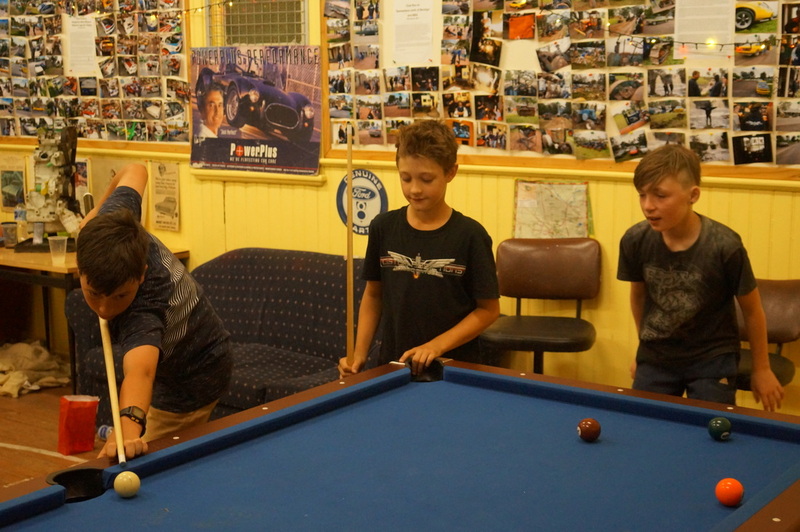 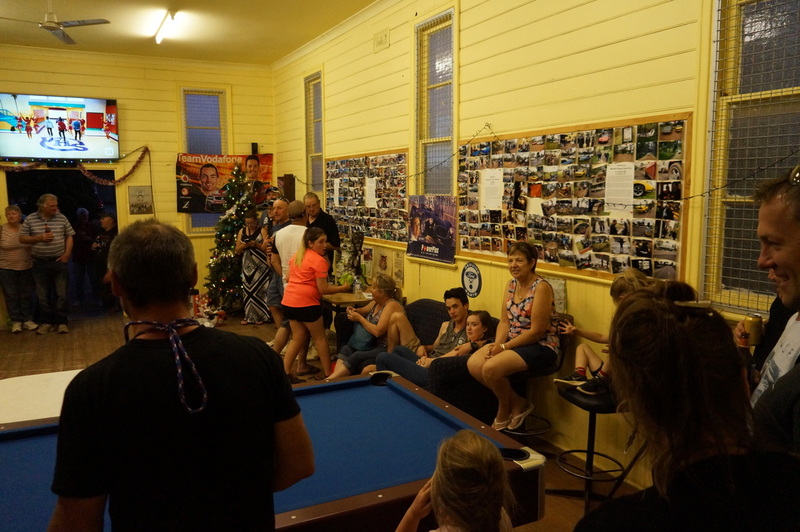 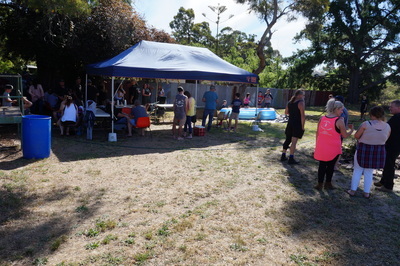 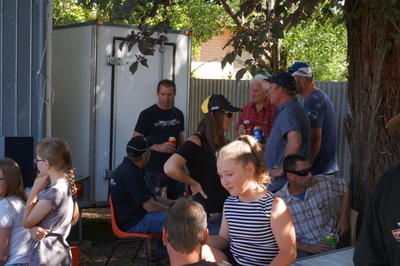 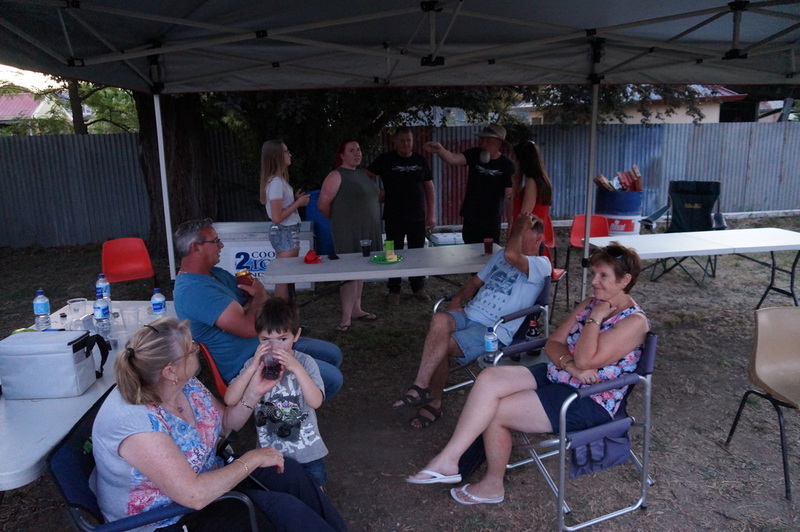 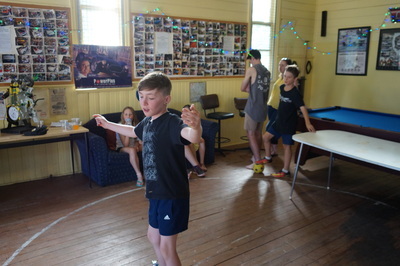 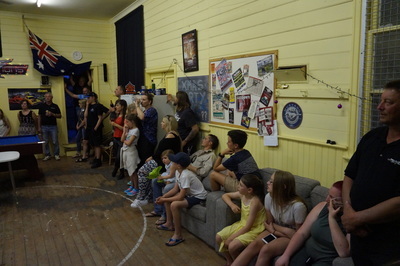 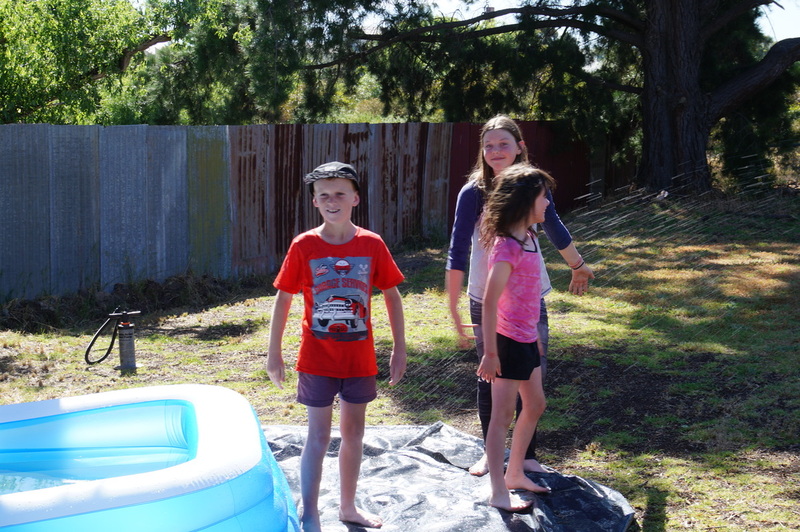 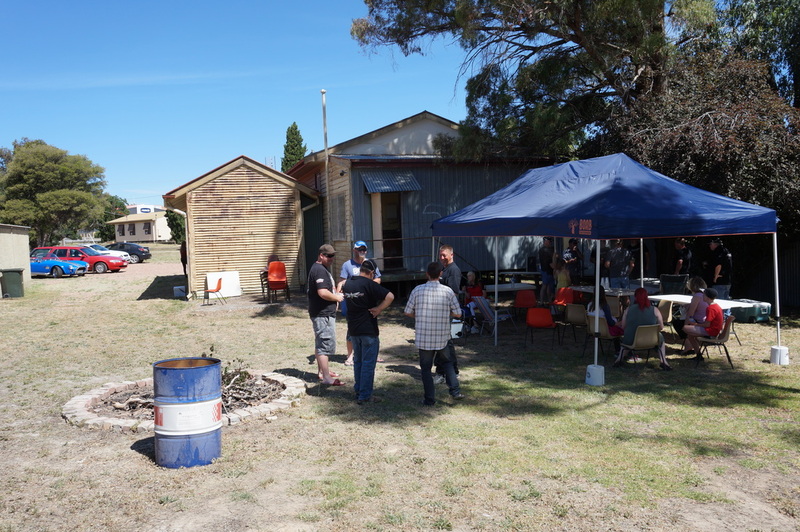 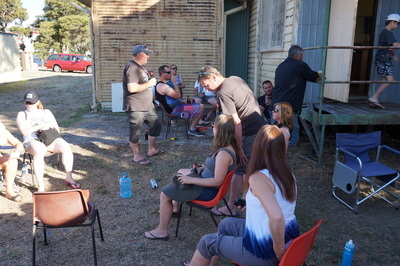 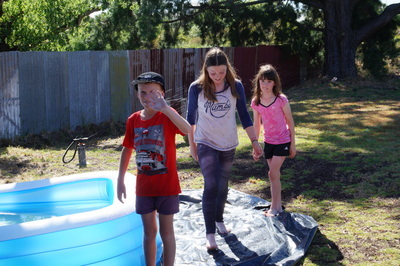 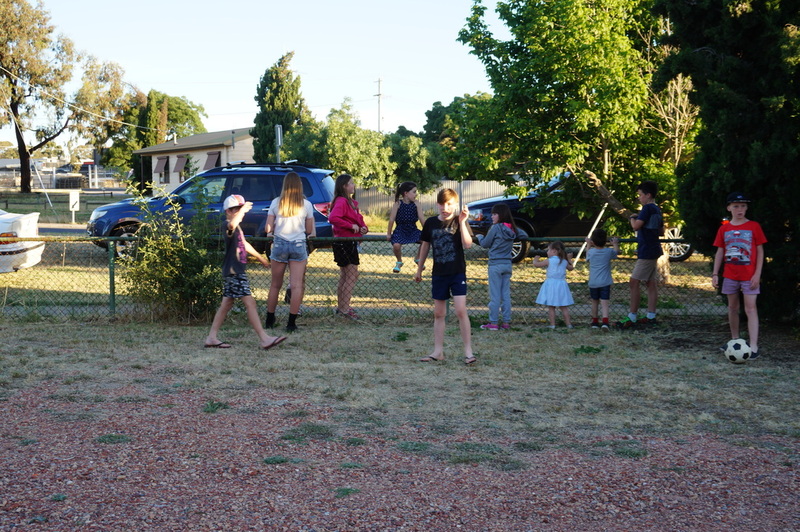 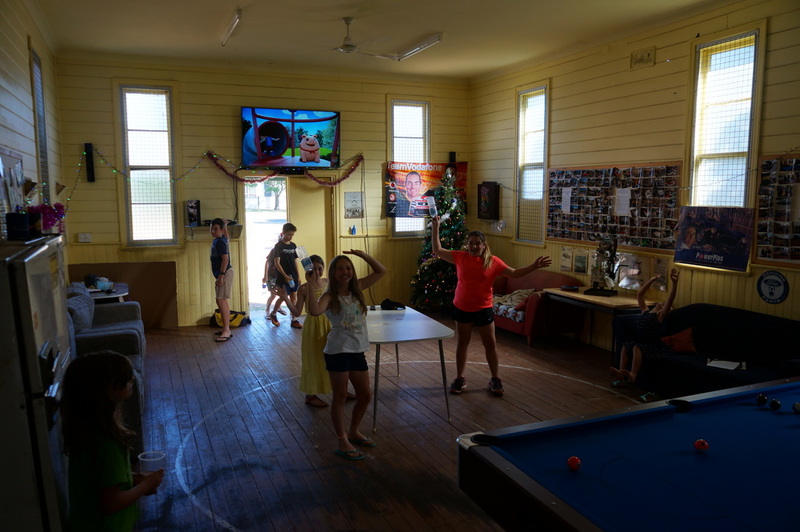 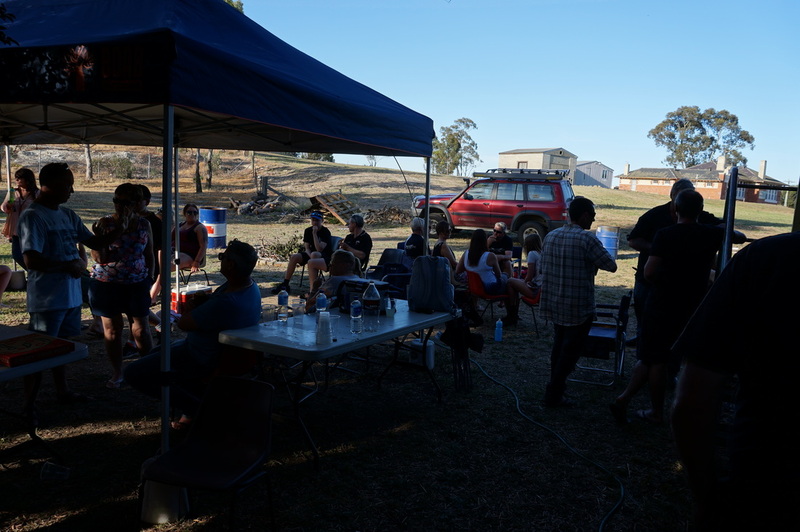 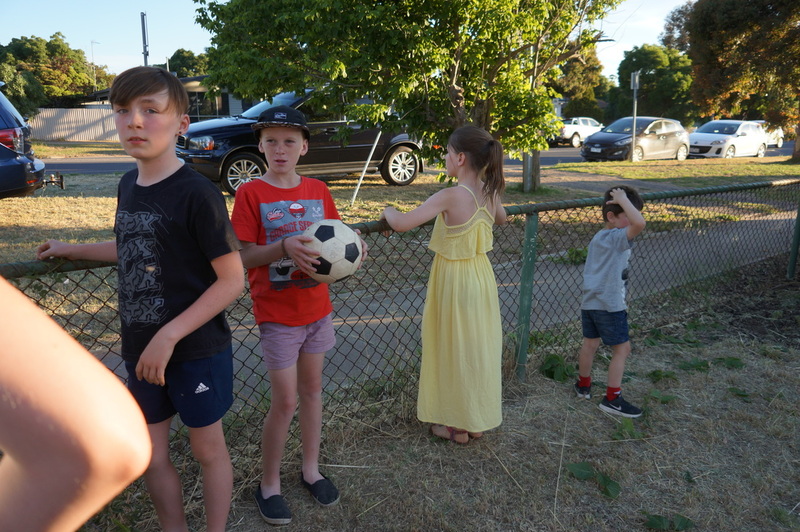 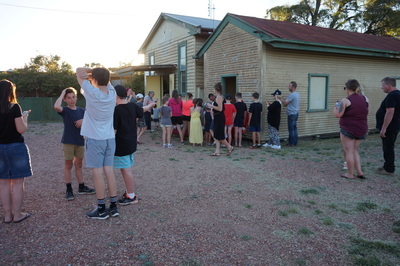 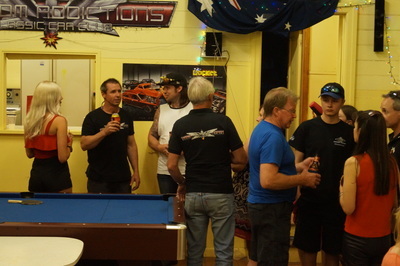 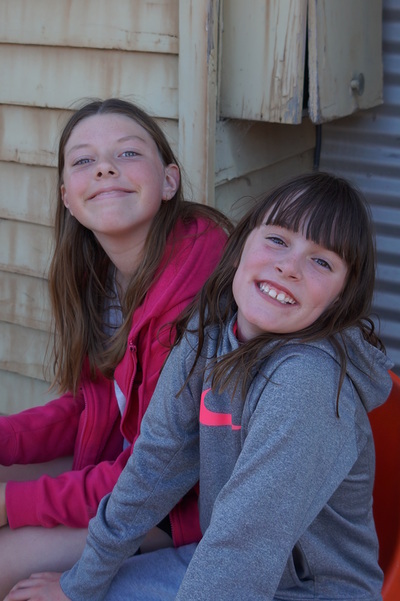 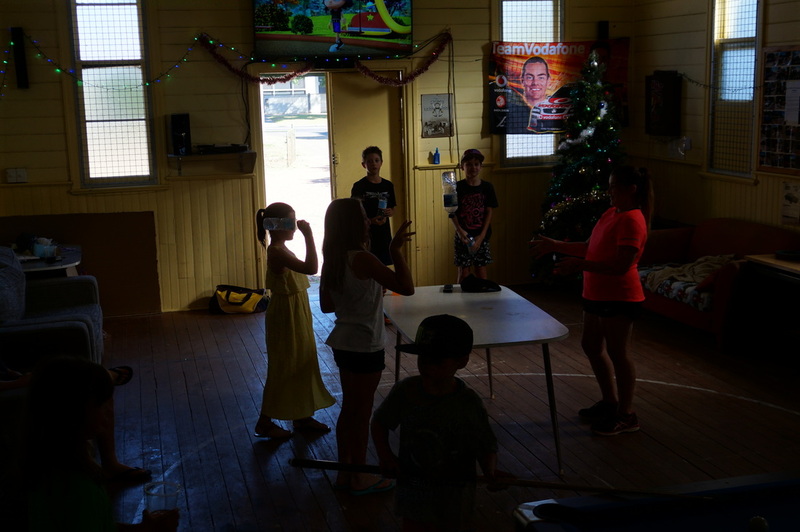 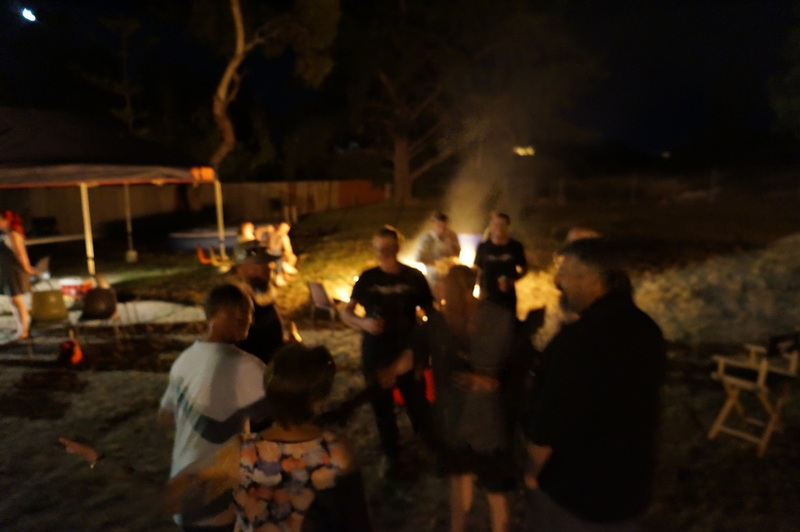 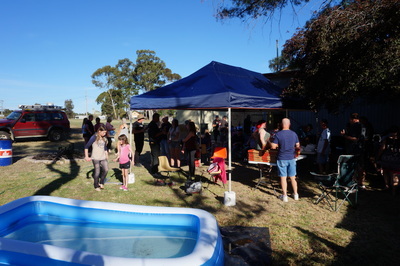 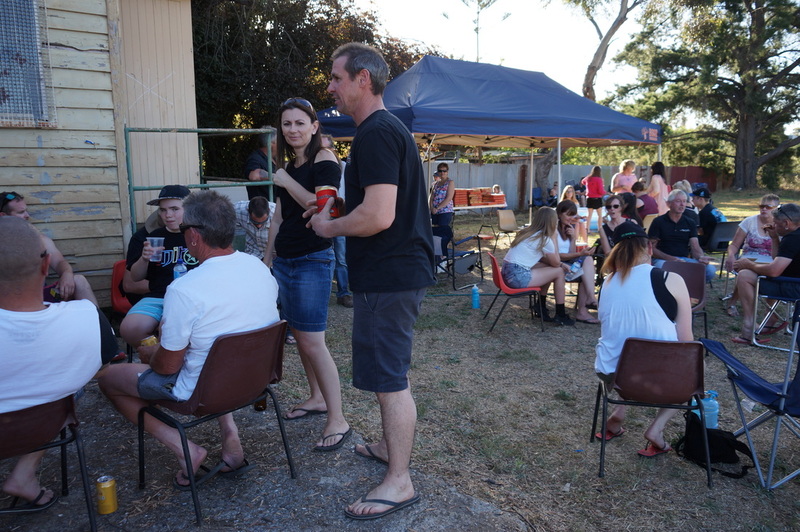 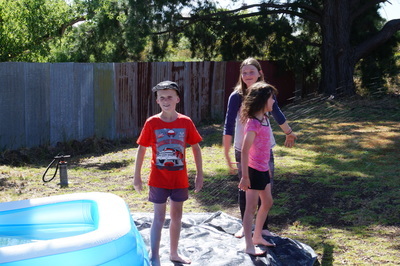 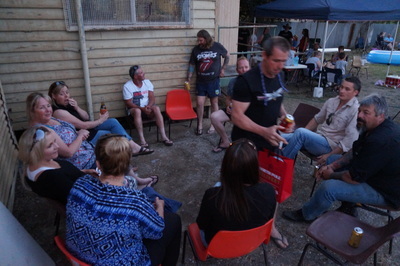 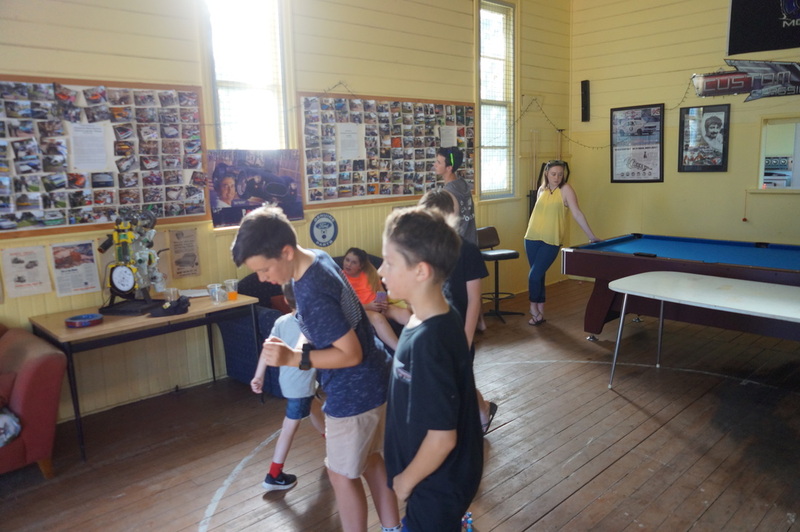 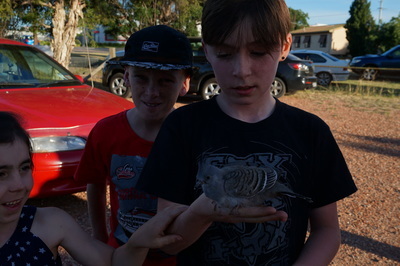 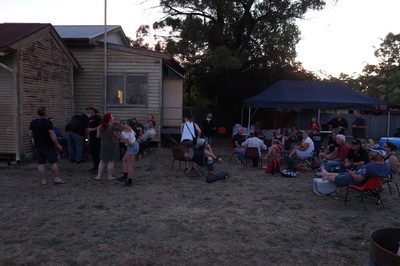 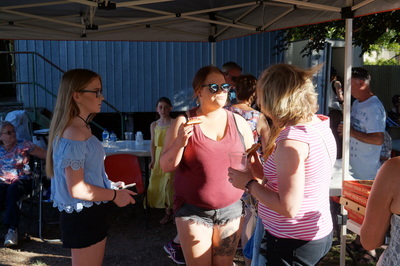 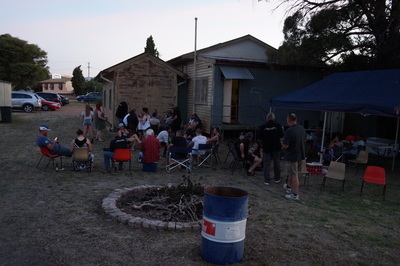 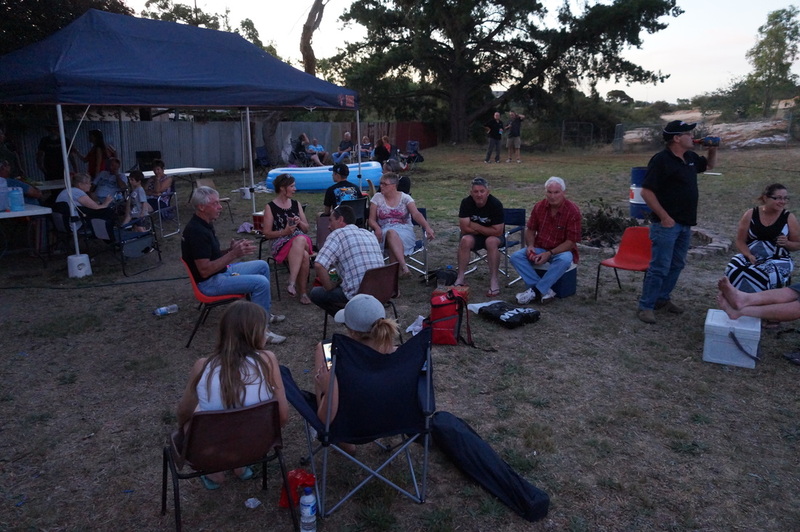 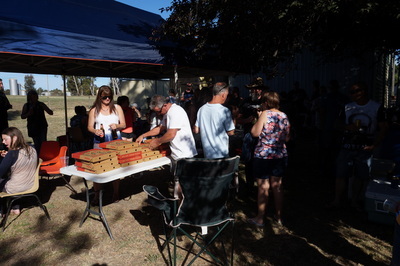 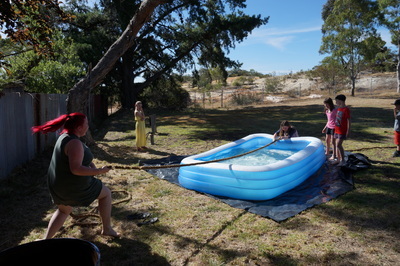 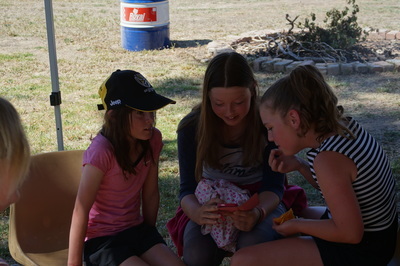 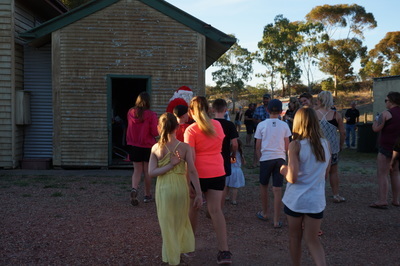 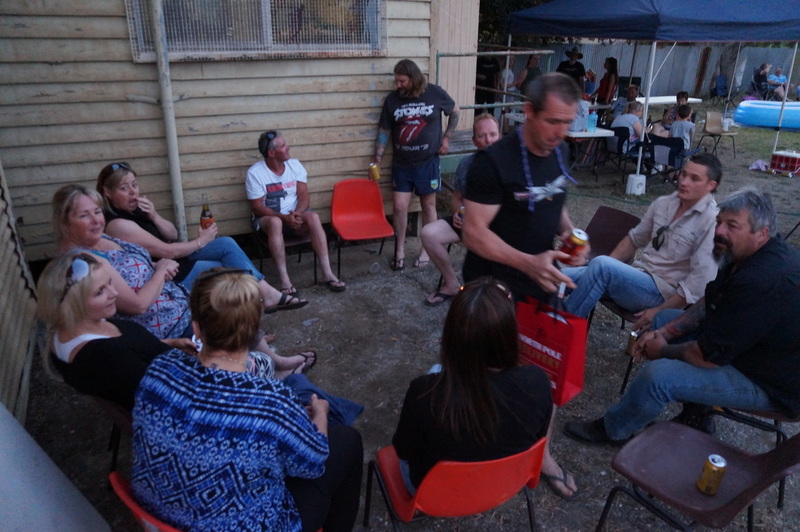 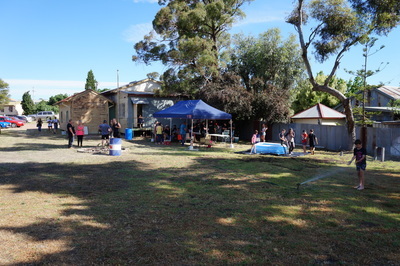 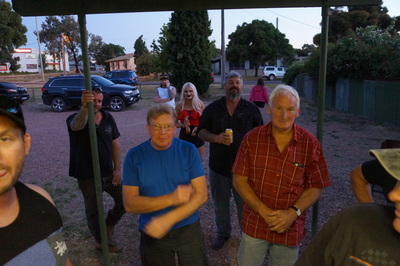 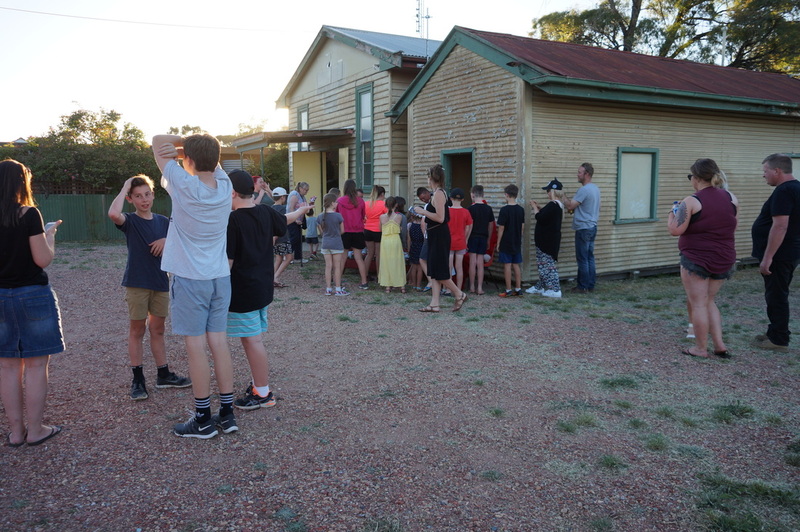 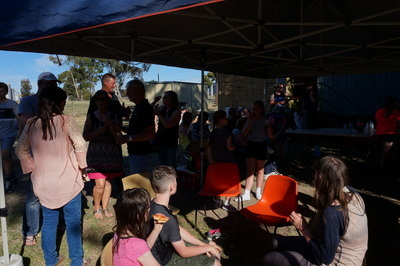 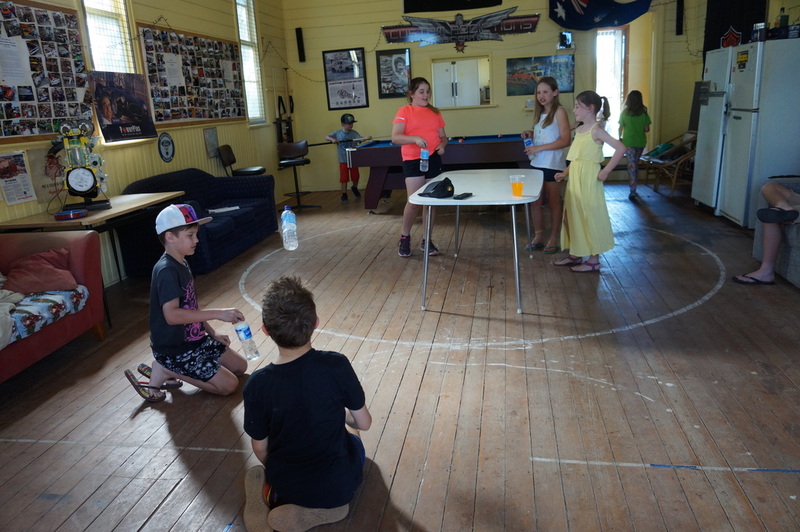 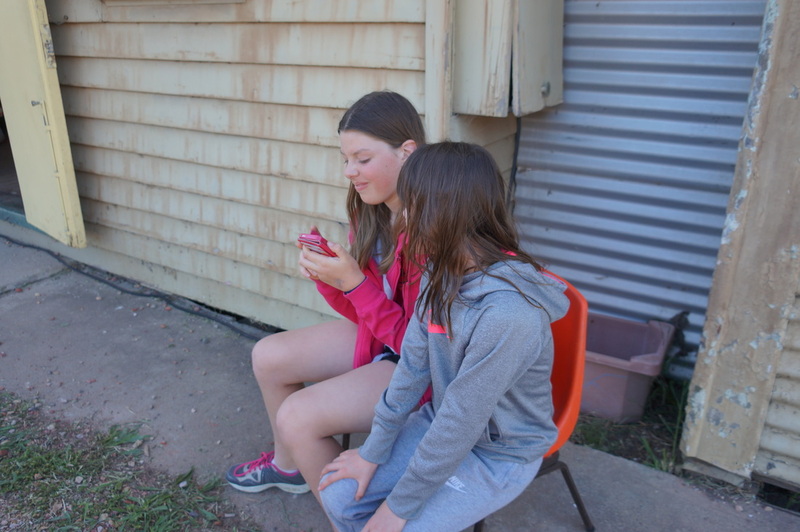 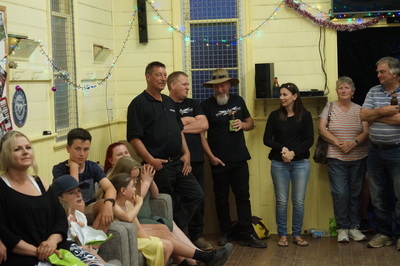 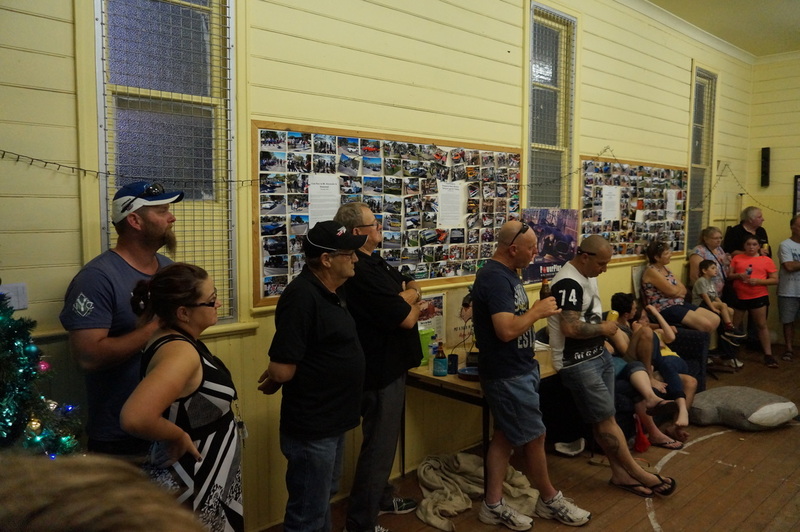 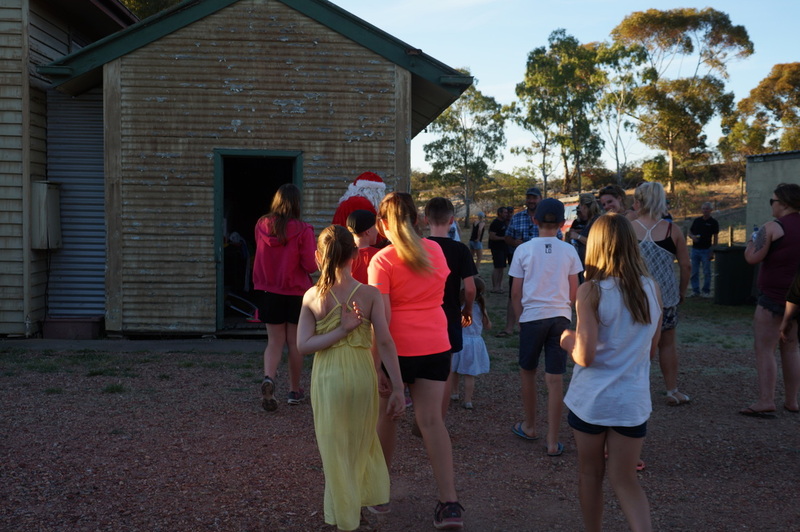 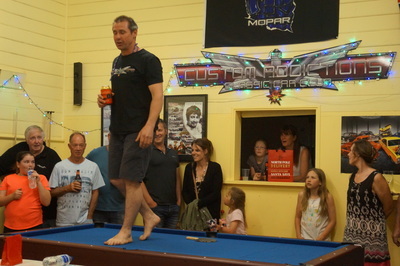 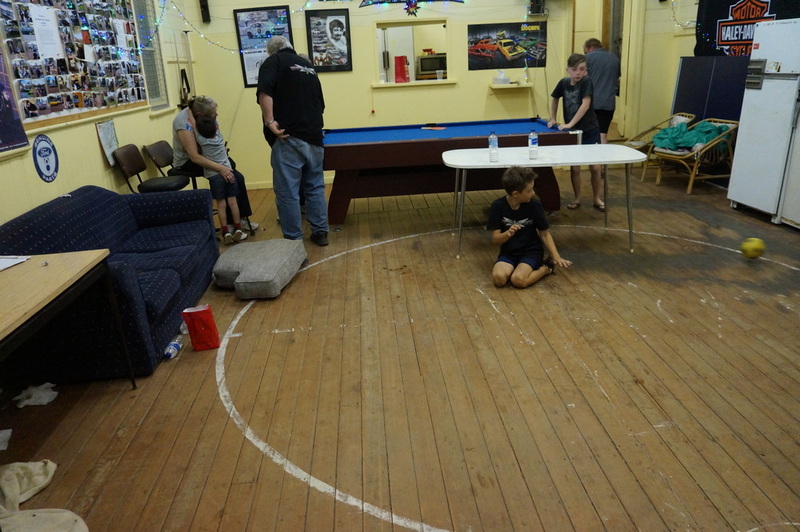 Members and their families started rolling up from mid-afternoon and by 5pm we had around sixty party goers and heaps kids. 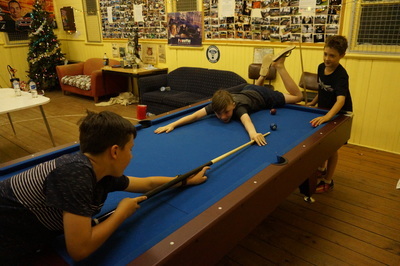 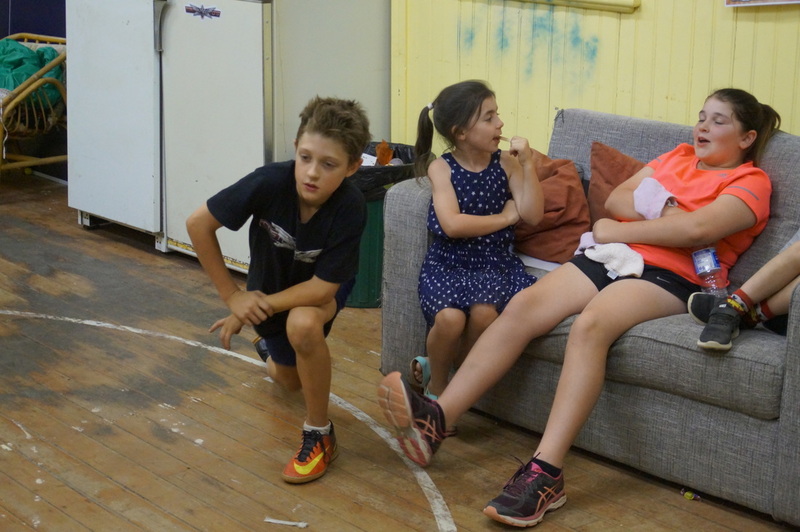 While the adults lazed around outside, the kids ran riot inside the Clubhouse. 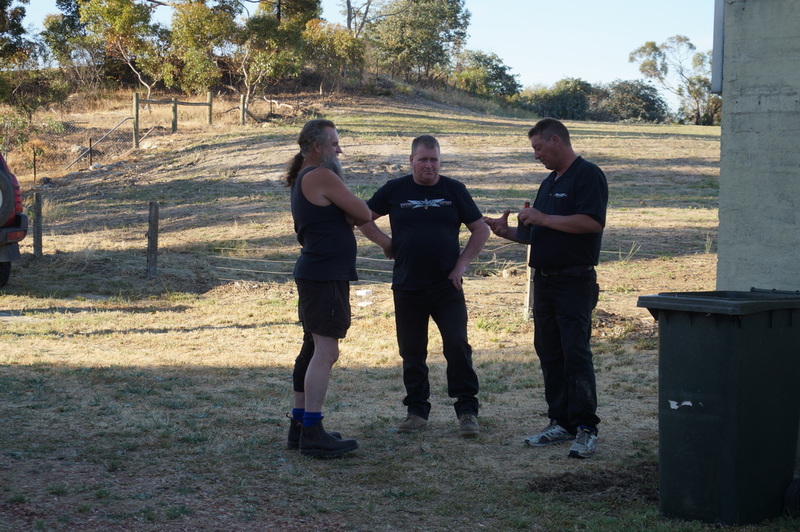 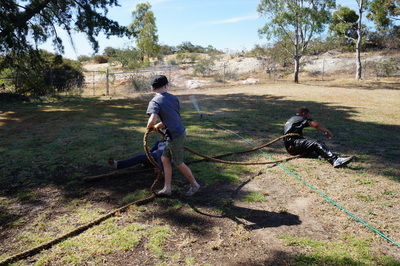 So it was peaceful outside until Hoota and Deano brought out the big rope. 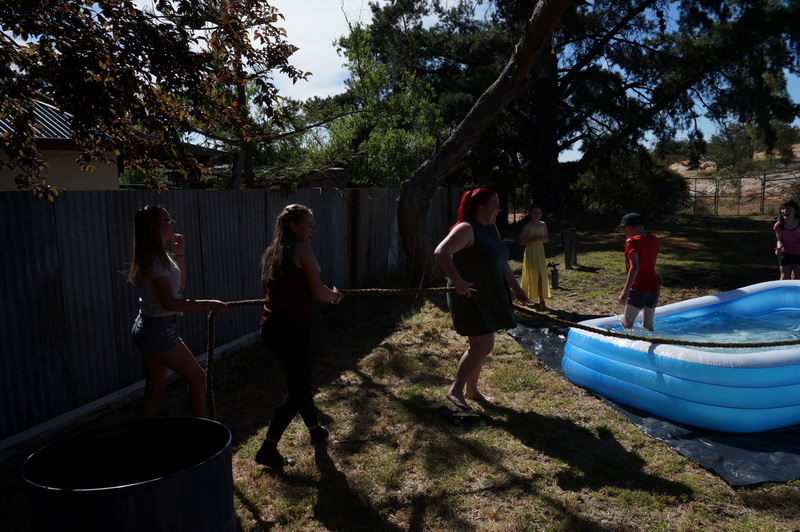 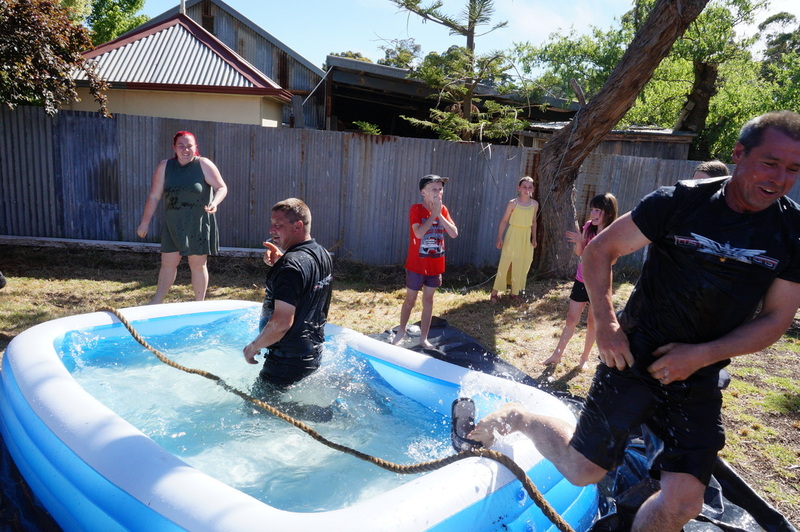 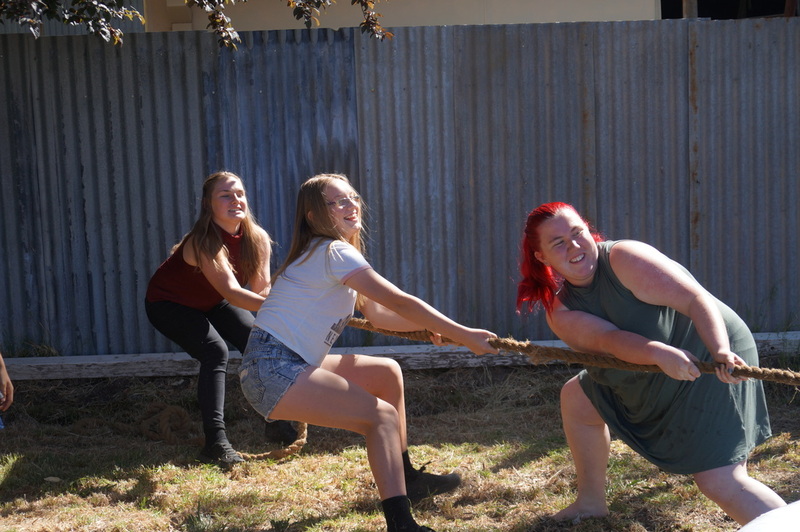 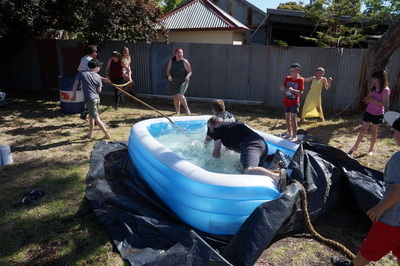 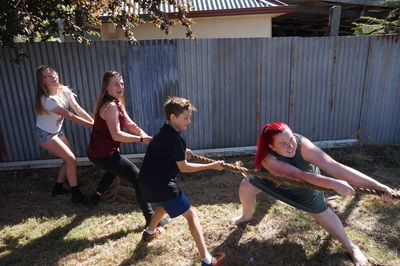 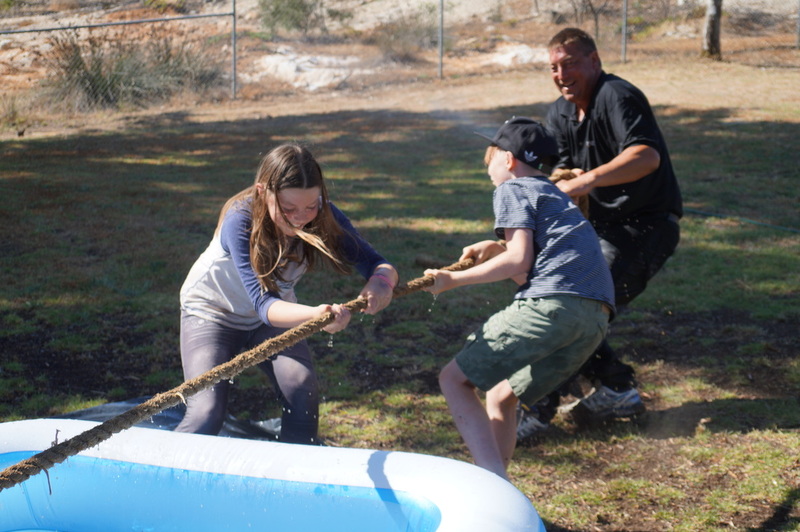 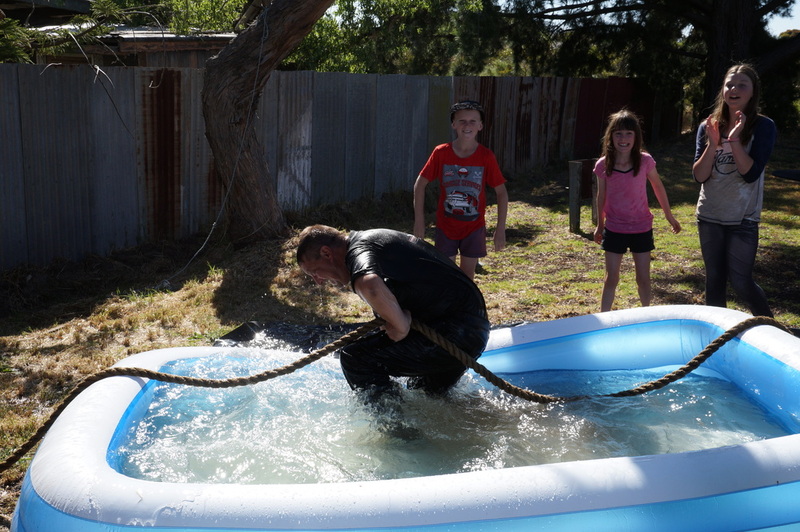 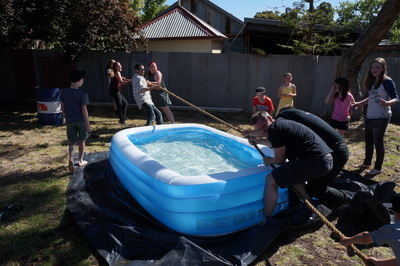 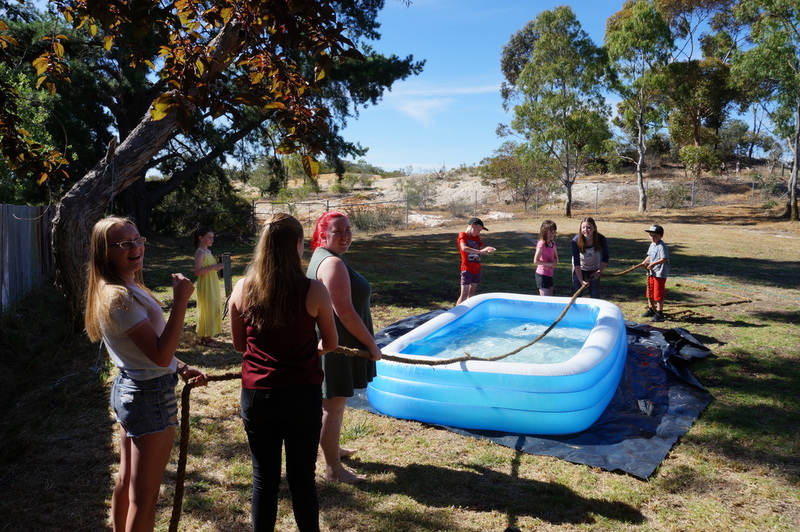 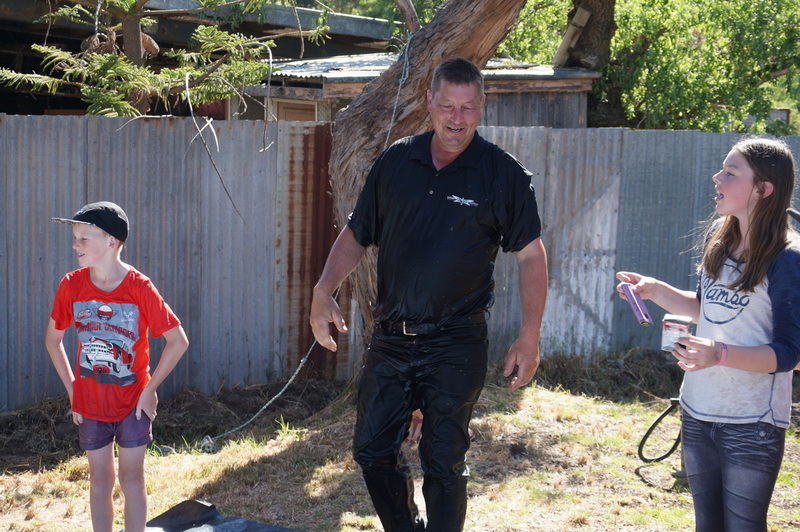 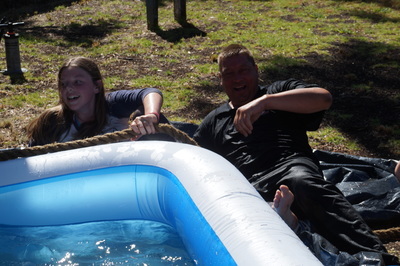 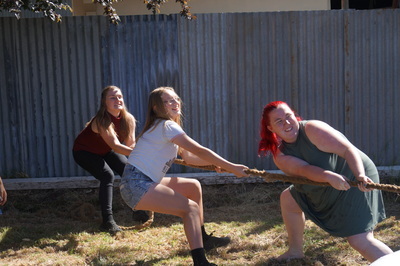 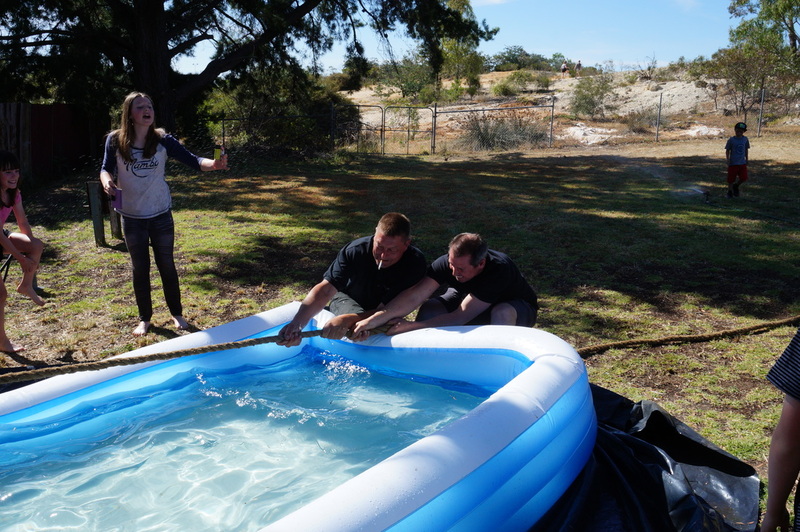 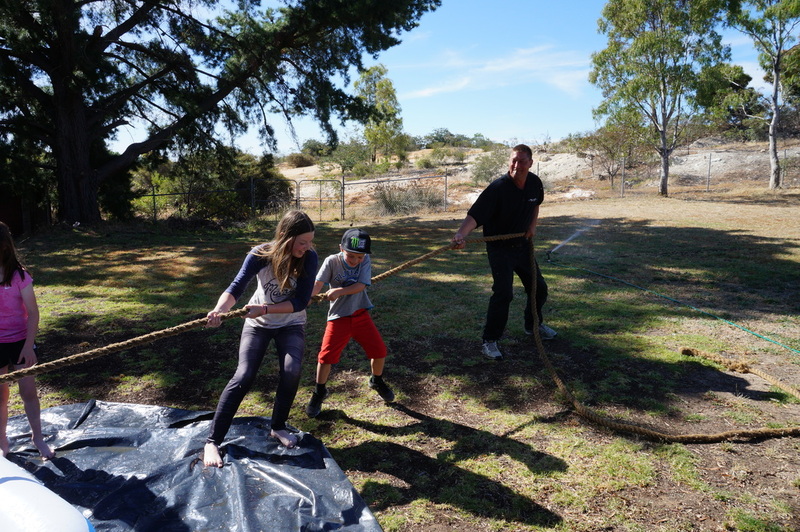 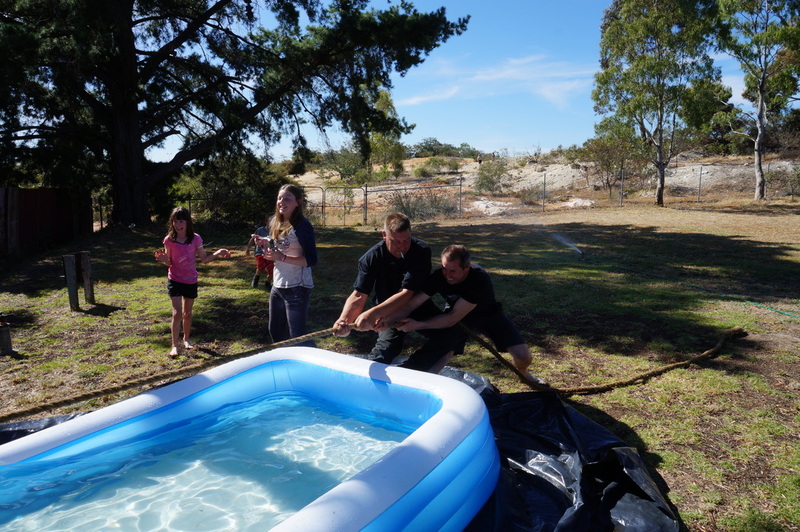 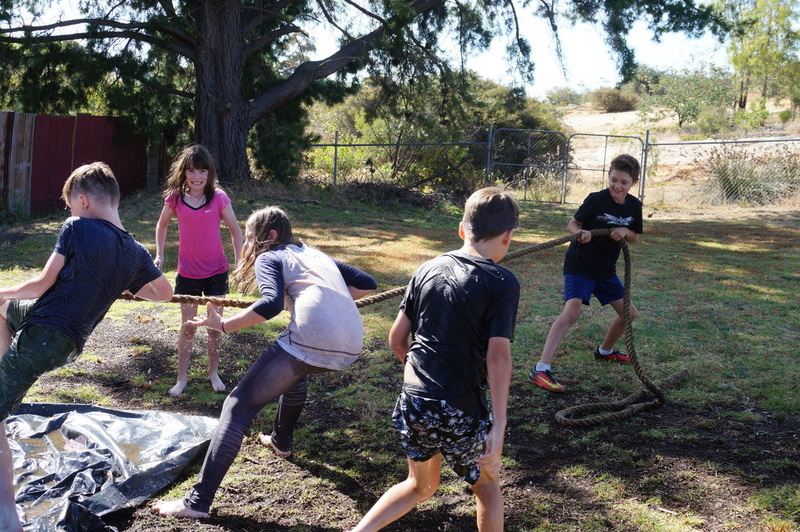 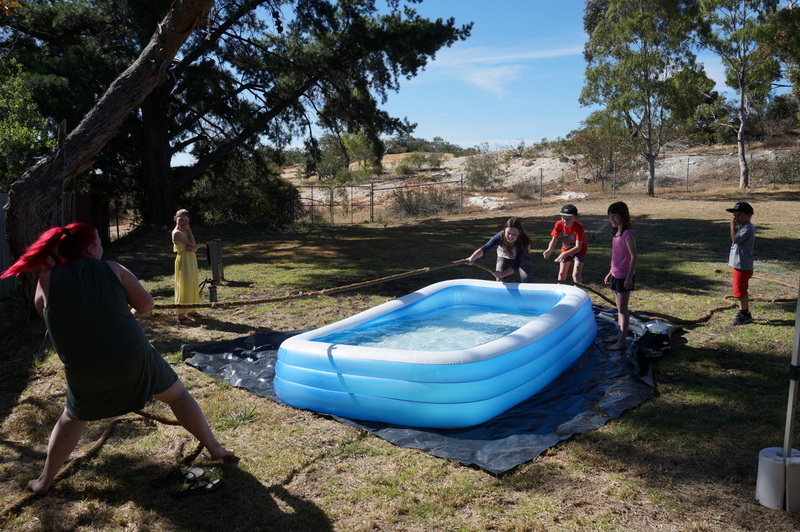 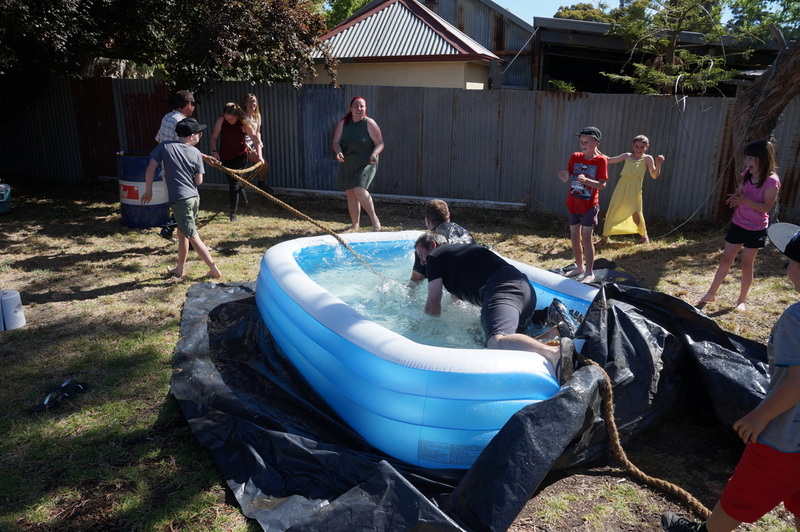 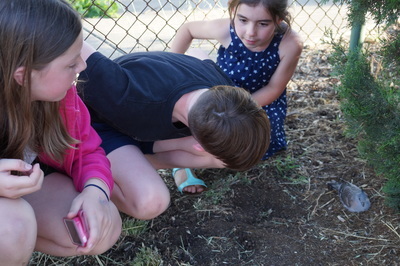 Initially, it was thought that they were going to tie up all the kids to a tree, but it turned out to be a much less dramatic tug-of-war, with teams over each end of the pool. All was fine with the kids happily playing nicely, until the adults got involved - then it got personal. Time to stand back and watch. 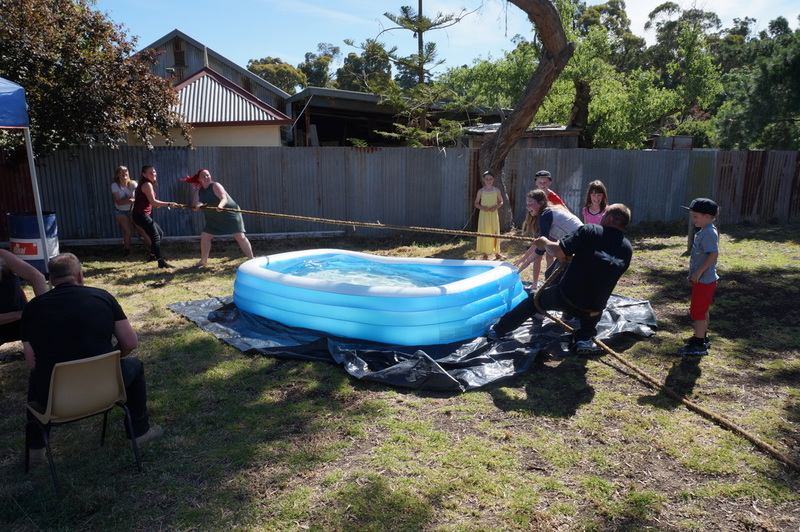 Although it did turn out to be one of the funniest things we’ve seen, they probably should have put the rope away earlier. 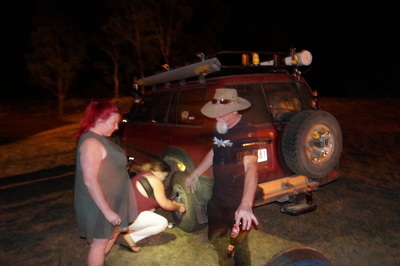 Deano’s cigs got a little wet, Kims brand new 4 day old iPhone got a little wet, but in the end no kids were hurt. 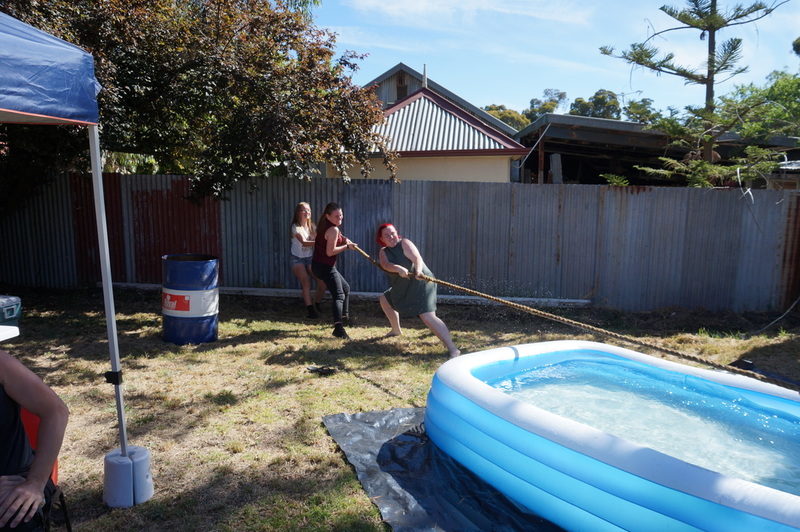 Some ego’s were bruised and there’s gunna be a challenge. 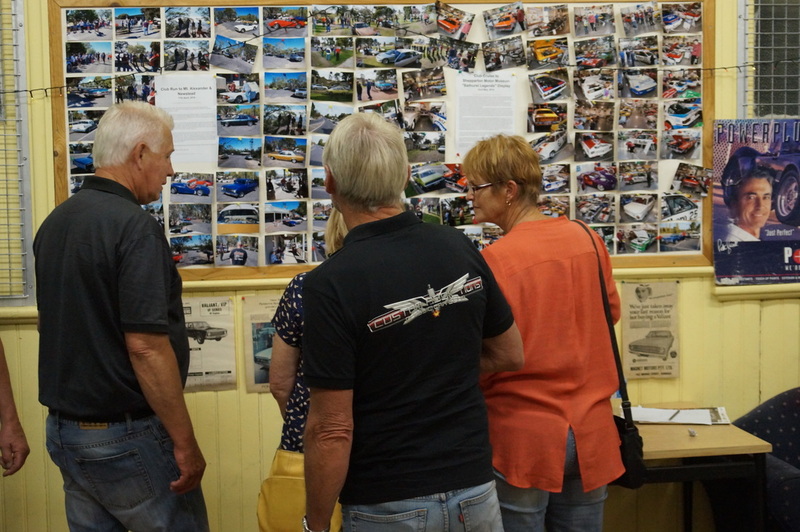 Checkout the photo’s below to get an idea of what occured. 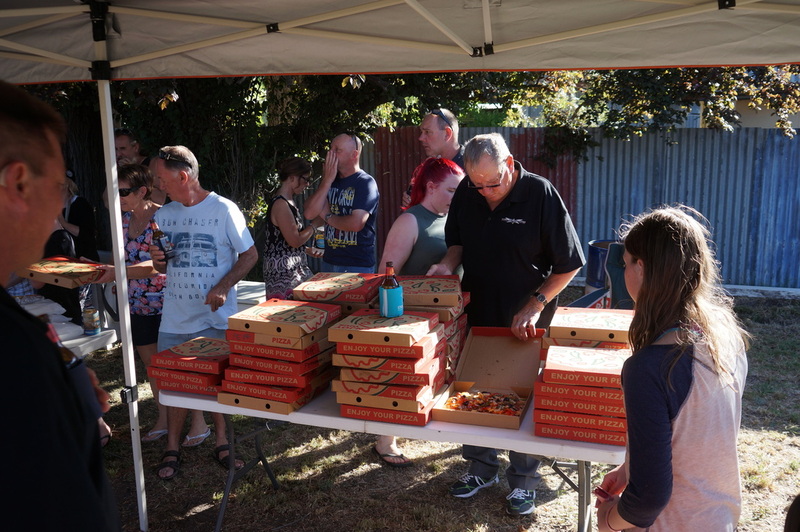 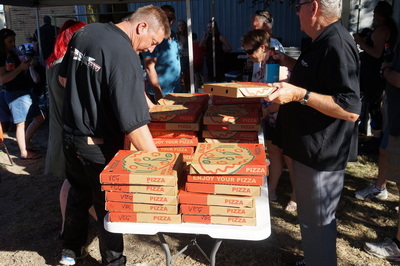 Another hilarious event of the night was Kim frantically trying to cancel the pizza’s that just kept arriving from the Epsom Pizza shop in 20 box deliveries. 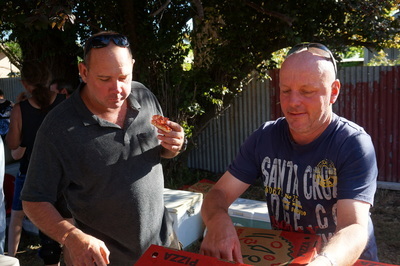 At 60 pizza’s he got through to the shop and was able to cancel the rest. 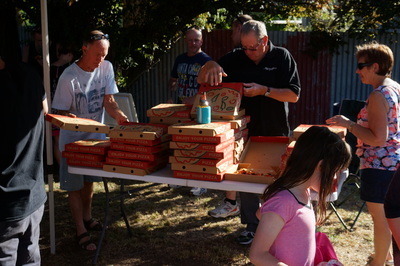 If you liked pizza’s, you didn’t go hungry. And we had a couple (16) left over for Sunday. 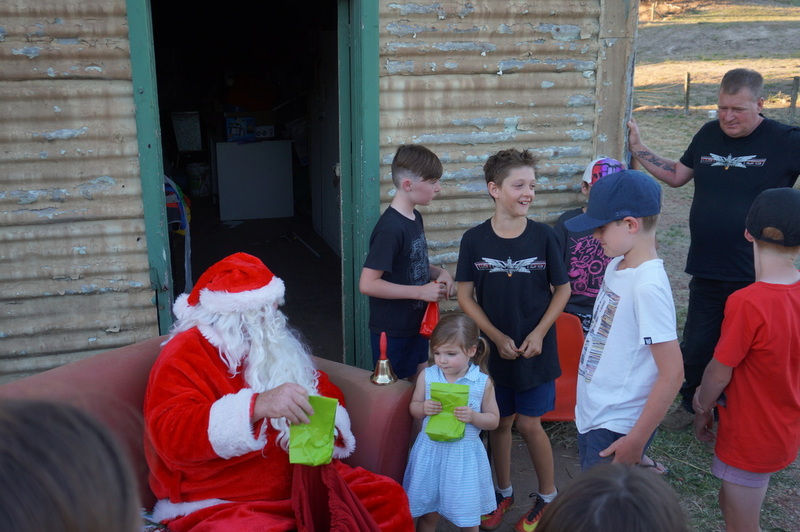 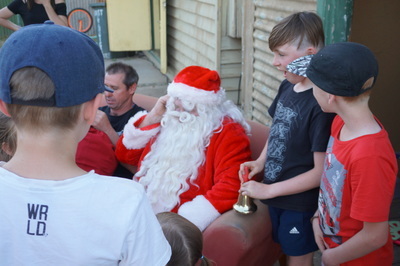 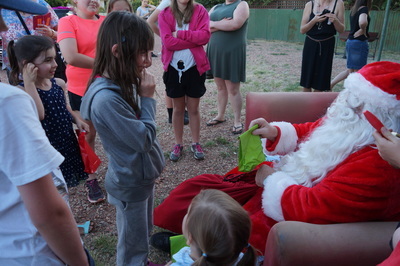 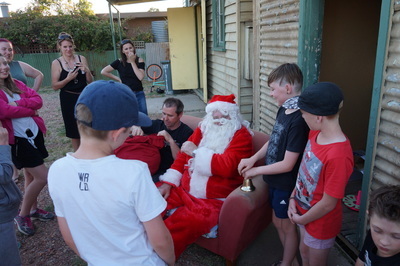 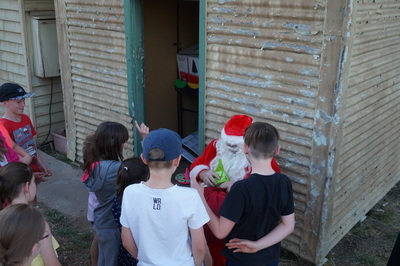 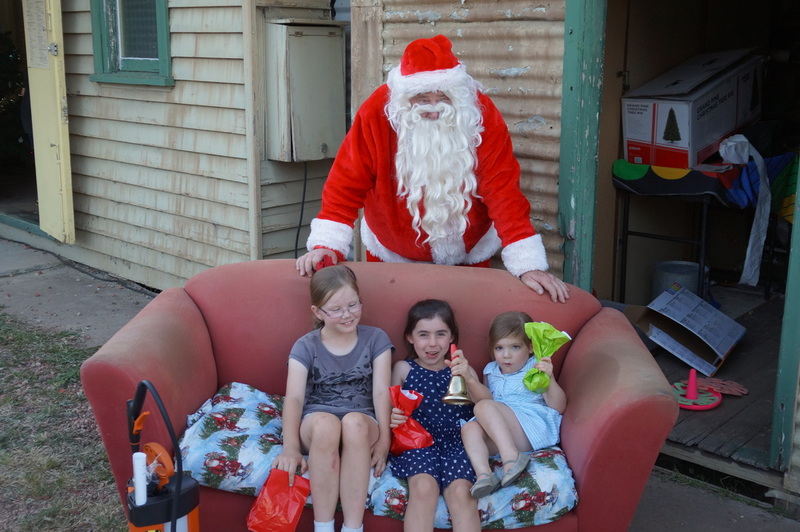 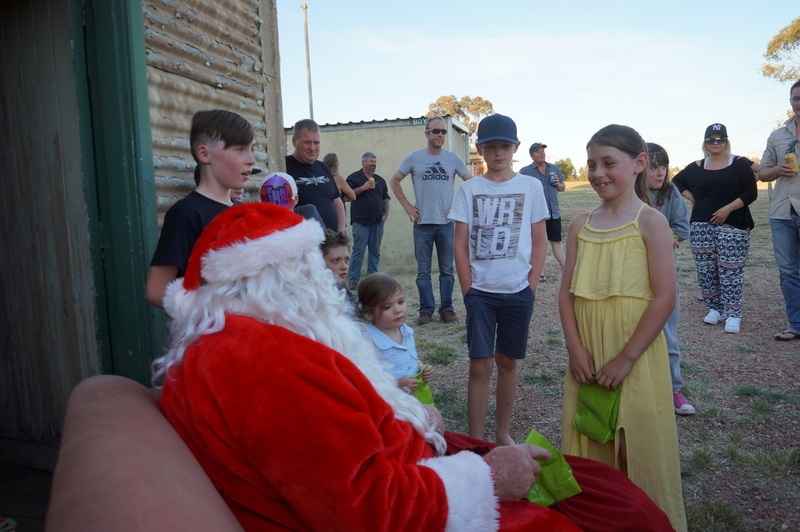 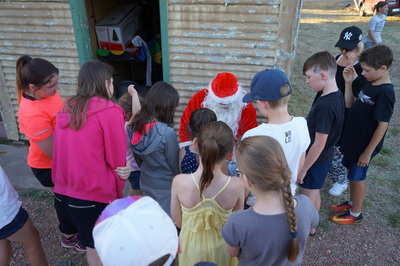 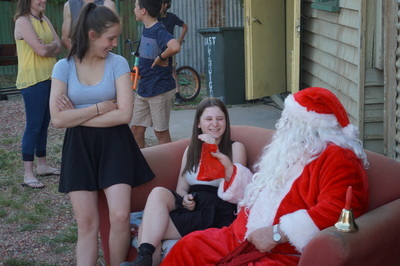 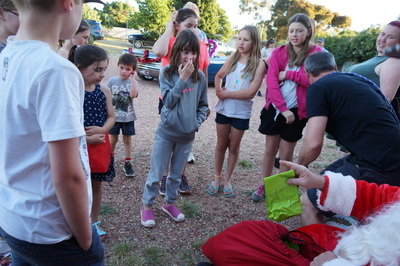 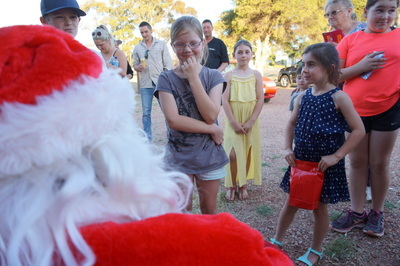 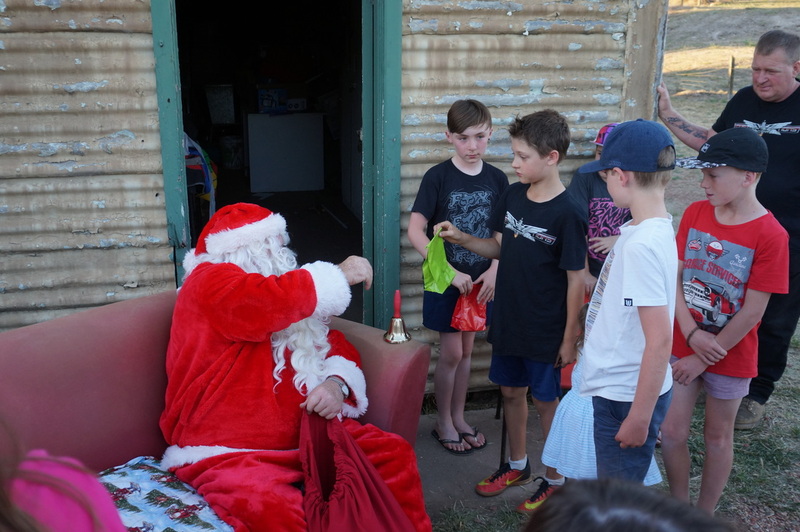 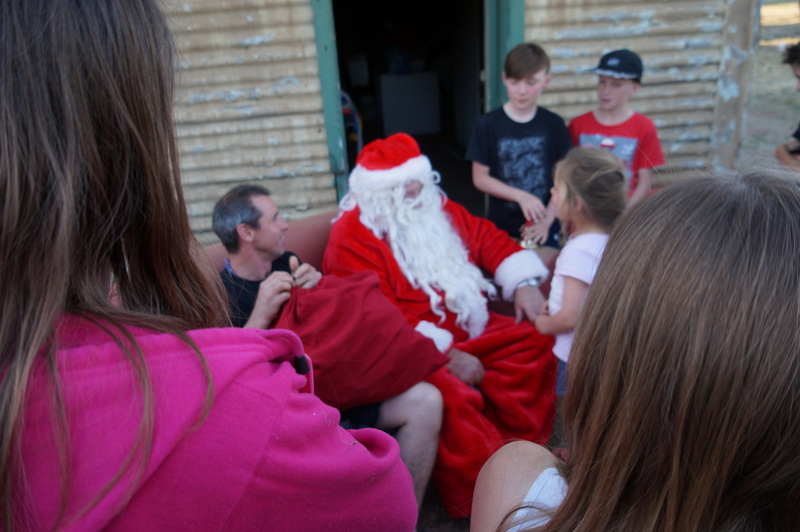 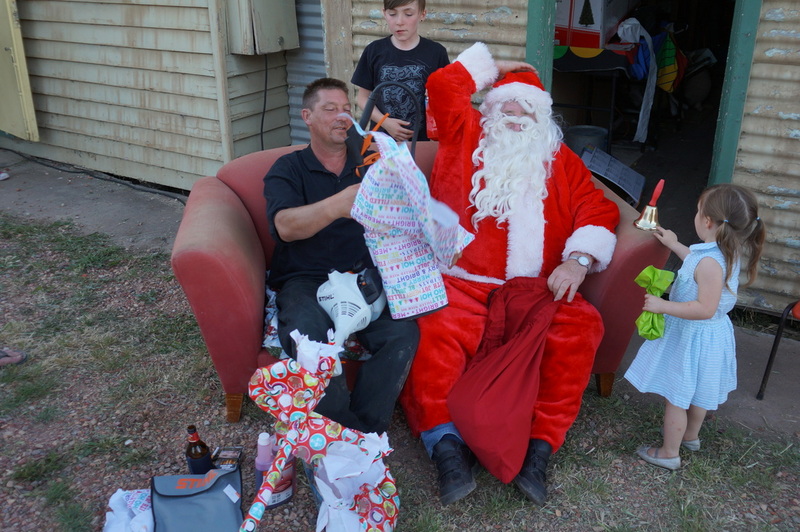 Santa, appearing a bit frazzled, took time out from his busy world travel’s to visit the kids – who were tipped off that he was coming and were all waiting out in the front yard. 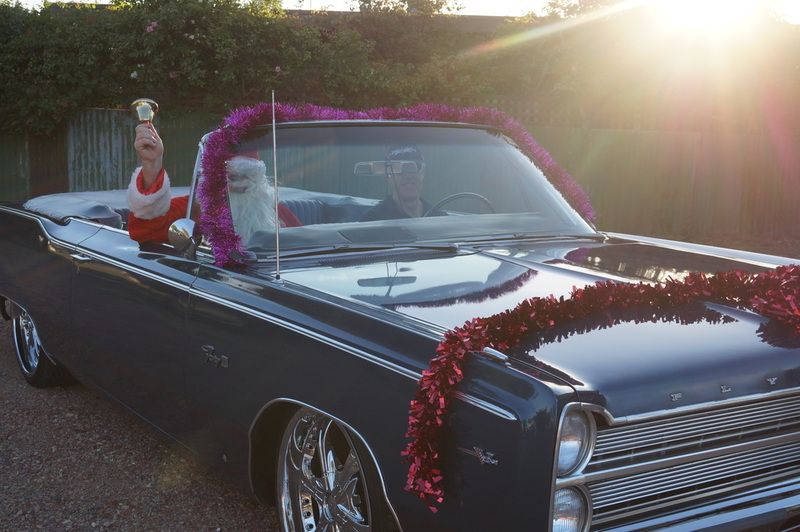 The fire truck from last year could have been a bit slow or maybe he was in a hurry, so for something different this year Santa went for a Mopar. 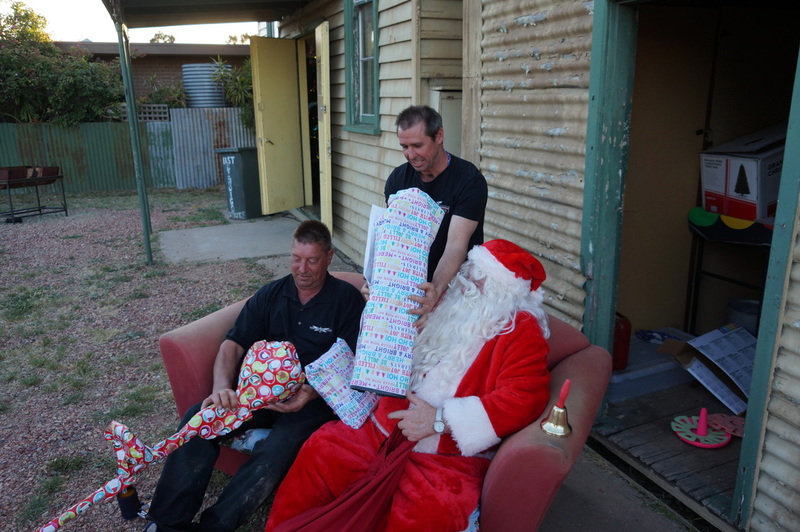 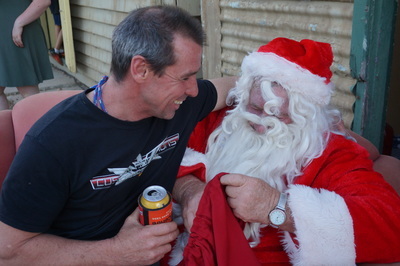 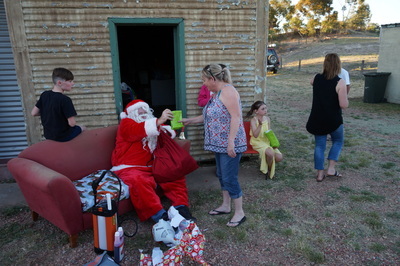 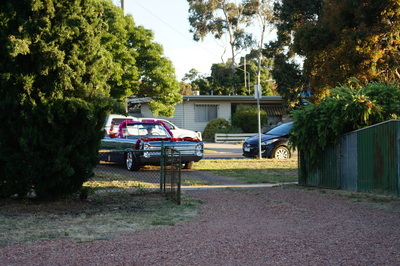 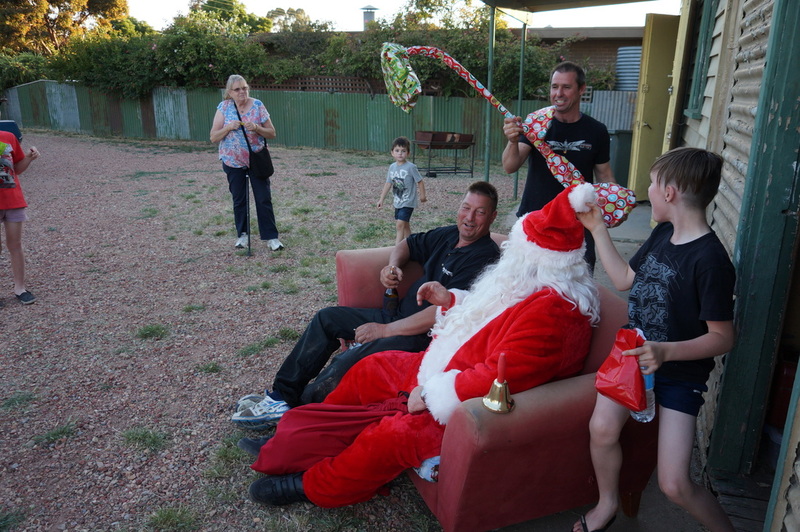 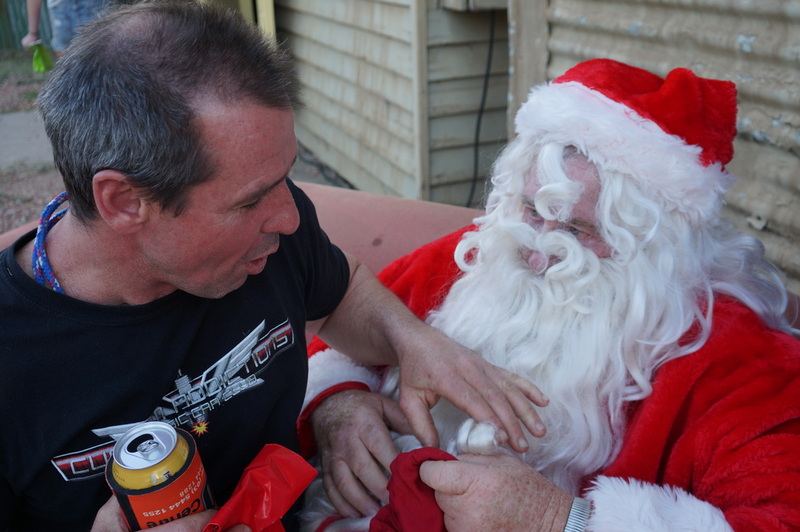 Good on ya Santa, thanks for stopping by and have a Merry Christmas. 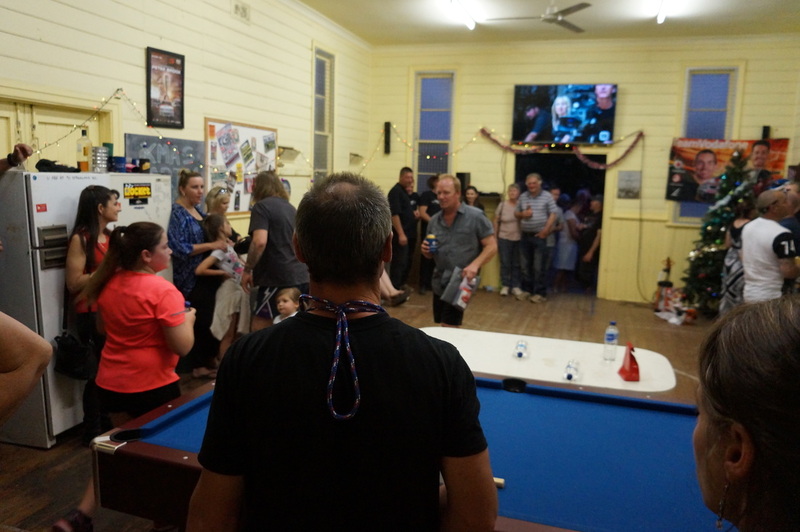 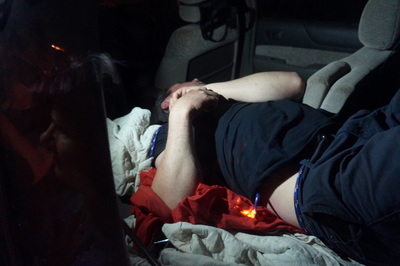 And then there was the incident that resulted in our Prez having to thread a rope around the belt loops in his shorts and then tie the rope around his neck for the rest of the night. That sounds a little weird, but he was extremely fearful of a retribution attack from another member that I can’t name – okay, Simon – who is 100% guaranteed to revenge his humiliating attack when our Prez dacked Simon in front of the crowd as he was leaving. No photo’s, way too much was exposed. 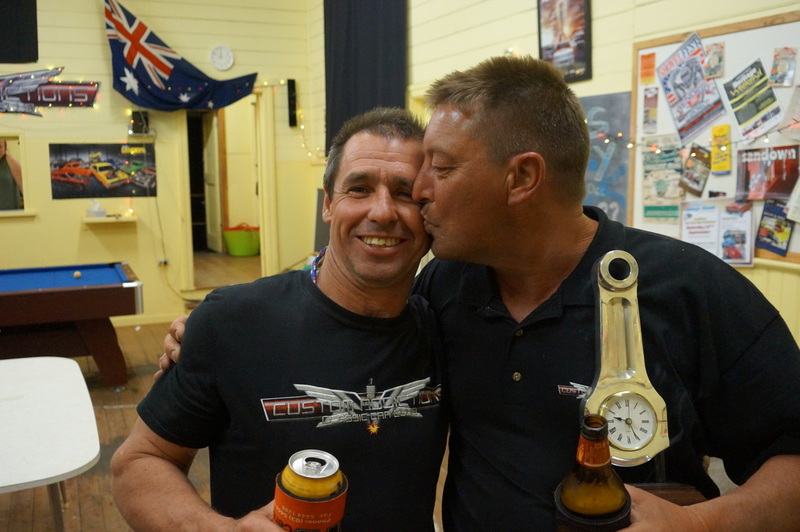 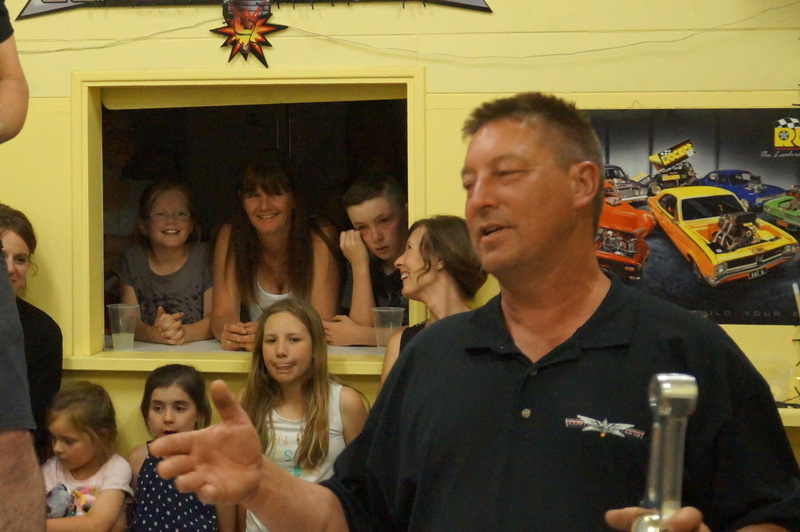 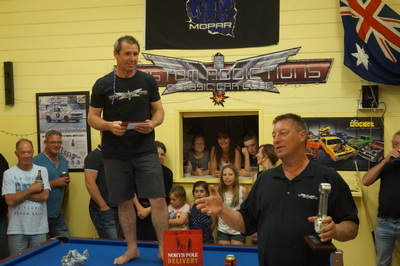 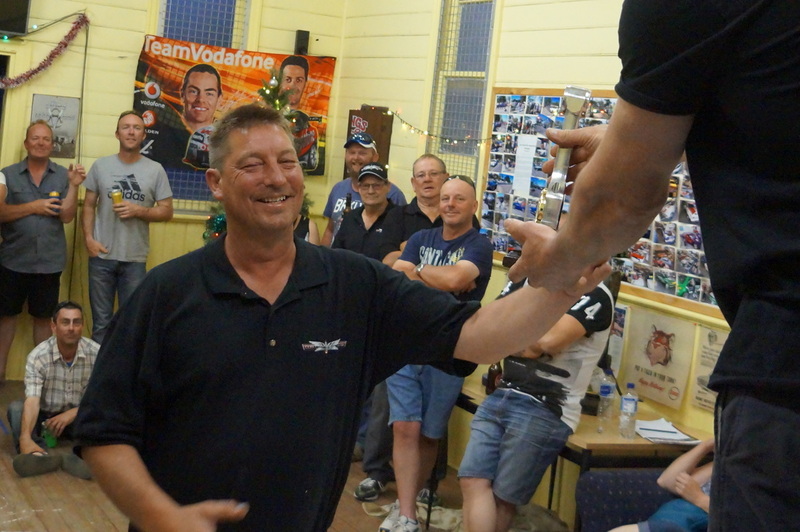 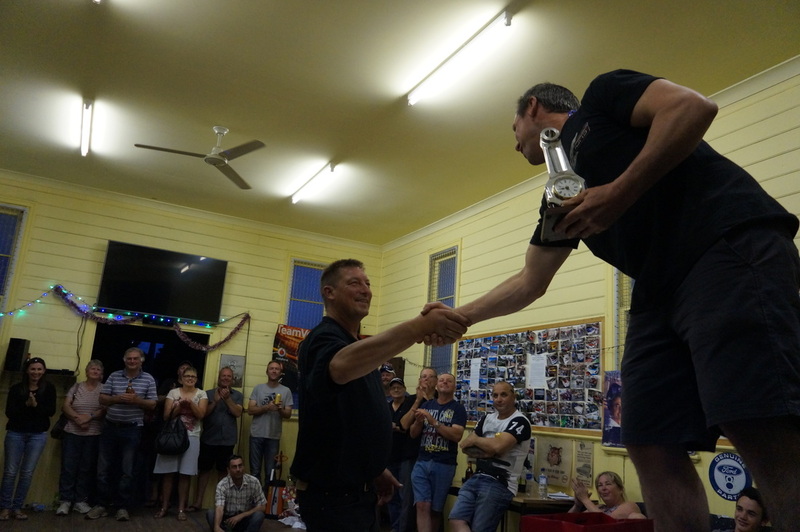 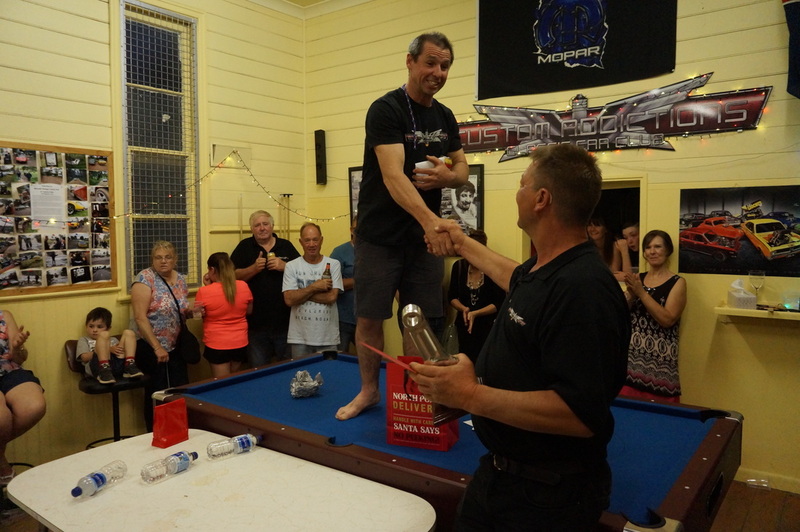 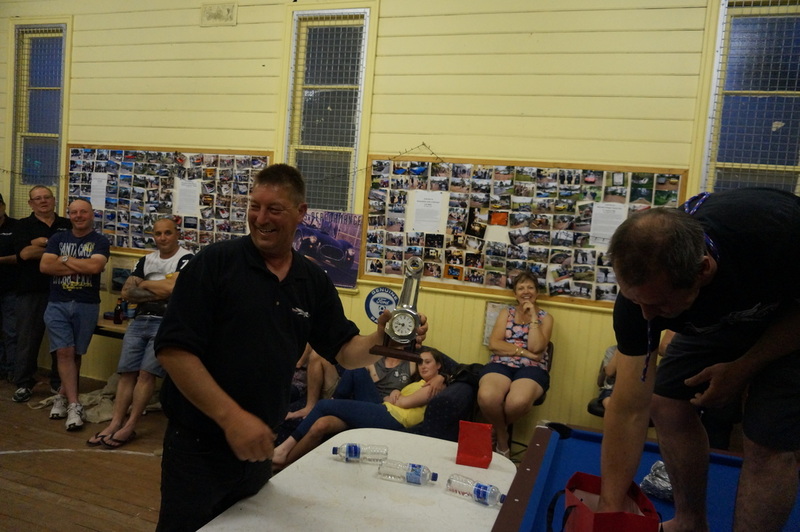 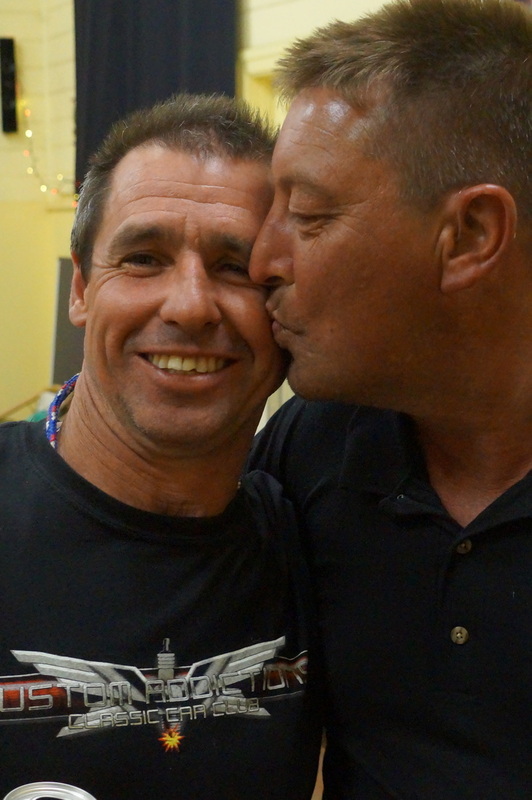 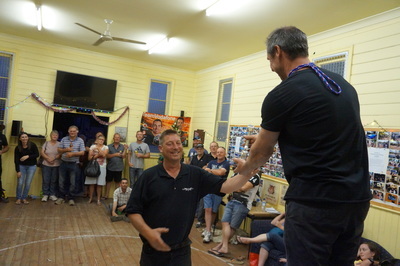 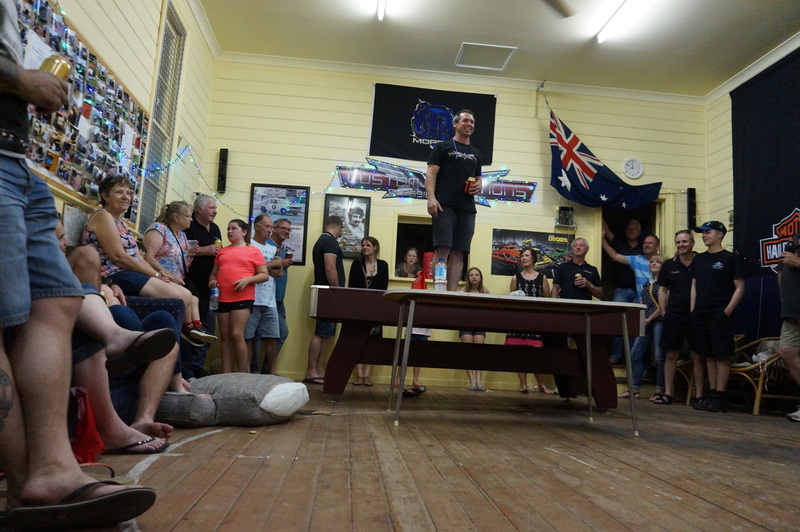 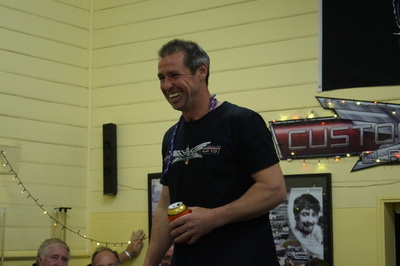 The awards ceremony went off exactly as Deano predicted, with him winning the prestigious ‘President’s Choice for Outstanding Contribution’ award. Well done mate, as much as you reckon you deserved it, you really do deserve it. 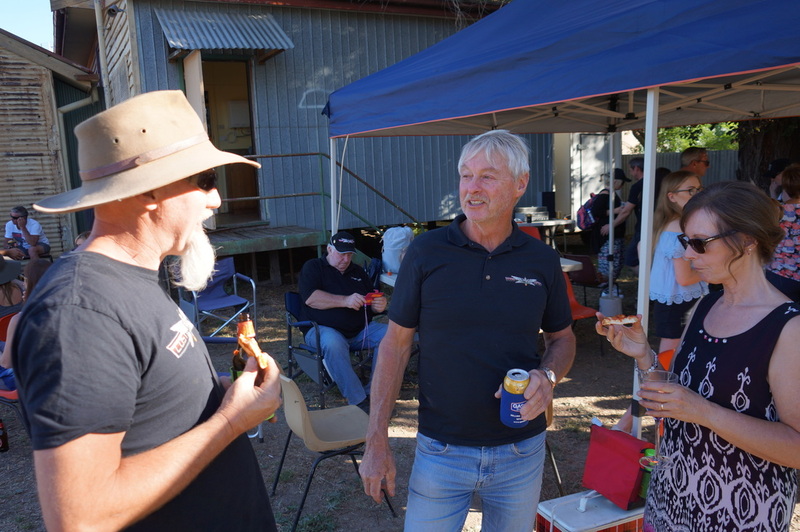 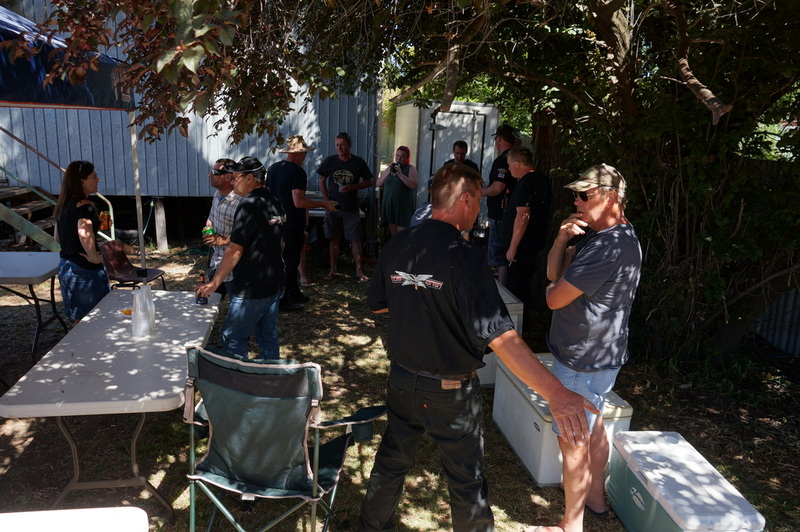 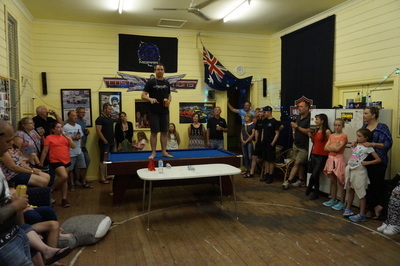 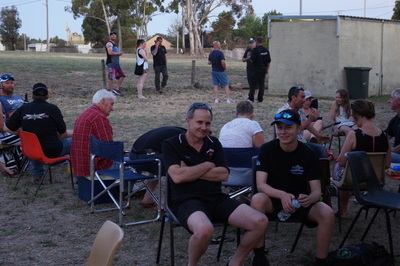 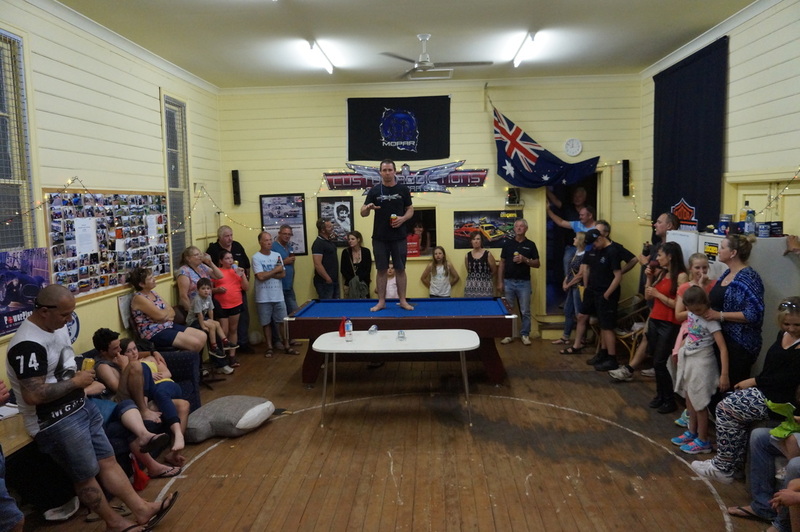 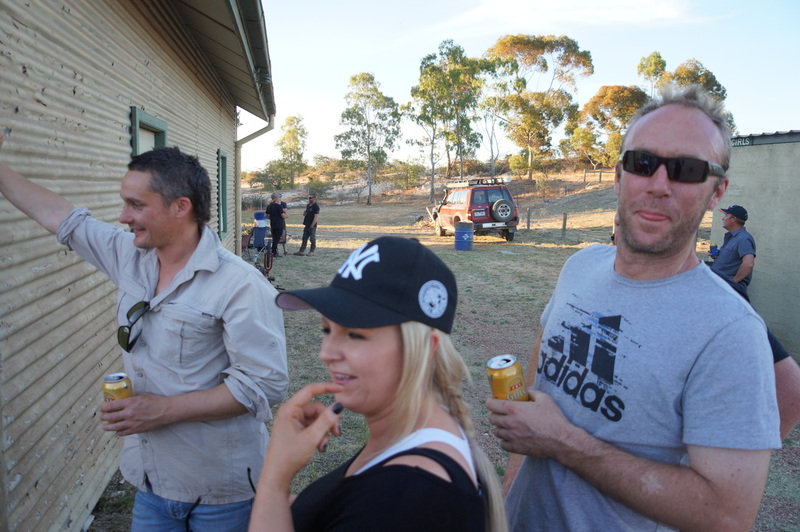 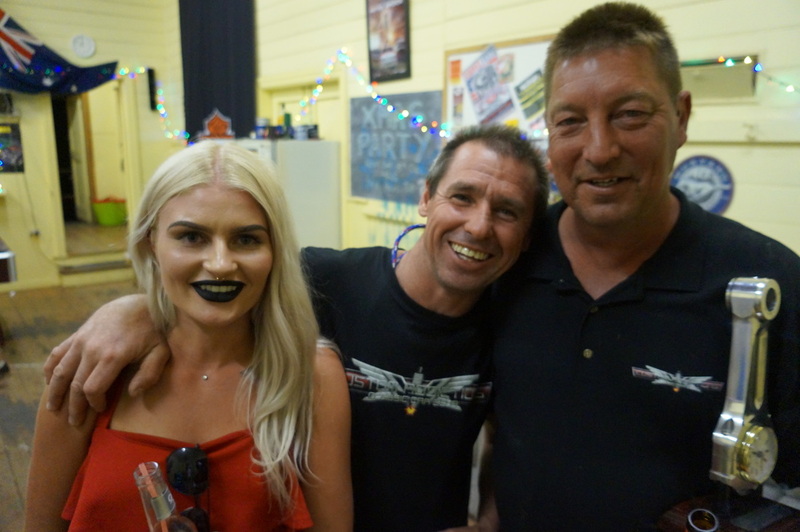 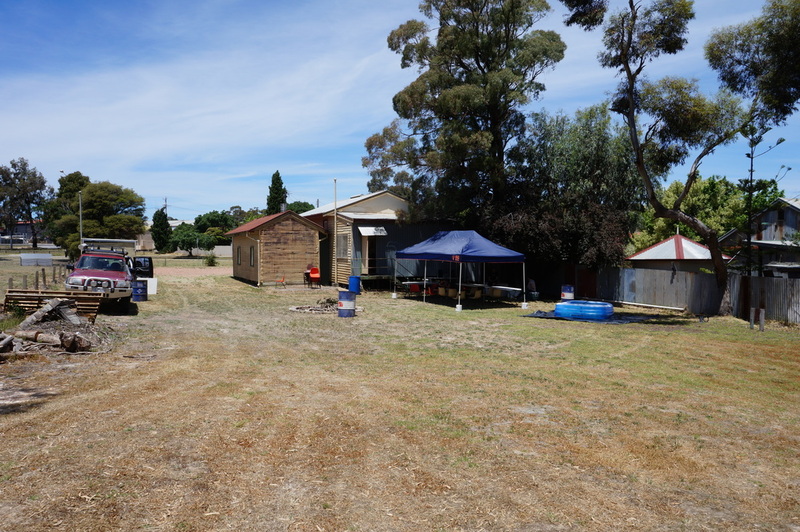 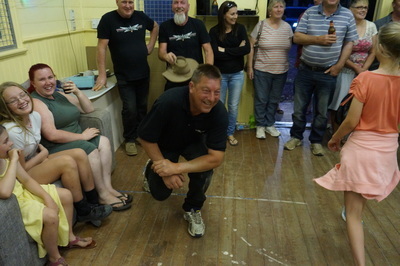 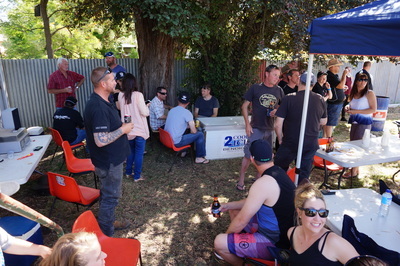 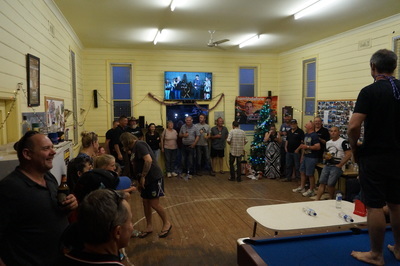 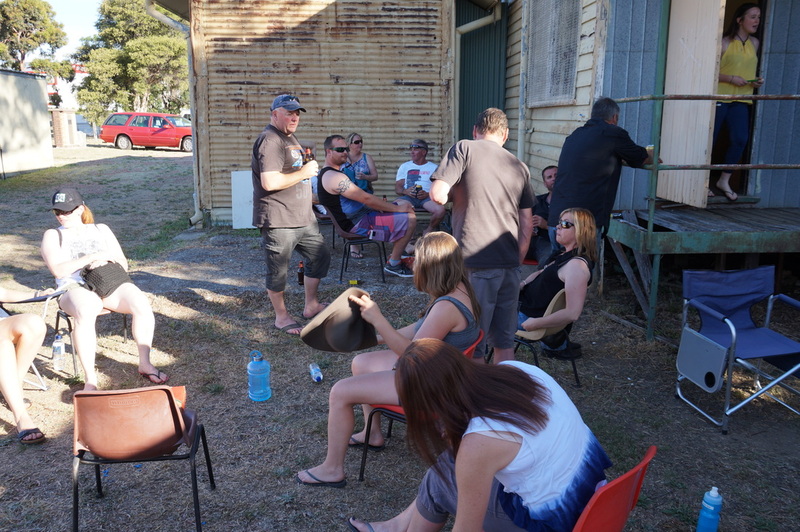 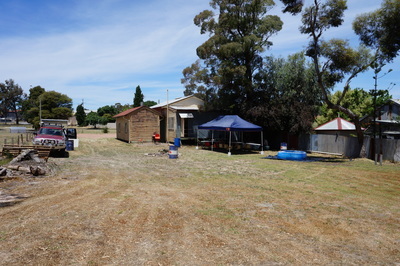 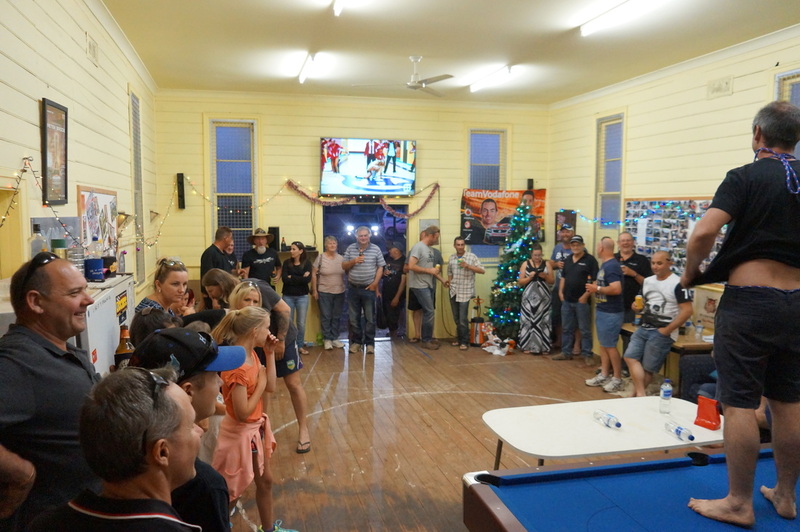 The amount of physical labour you put into the property and the hard yards you do opening up the Clubhouse and organising the food and the beer and the all the other stuff every Friday night is outstanding. 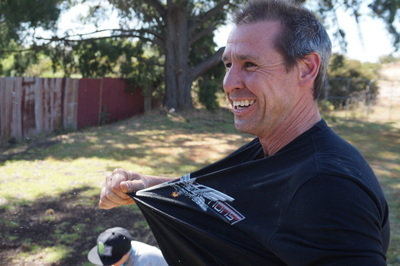 Good job Deano. Between you and Hoota, the Clubhouse runs like a well oiled Hemi. 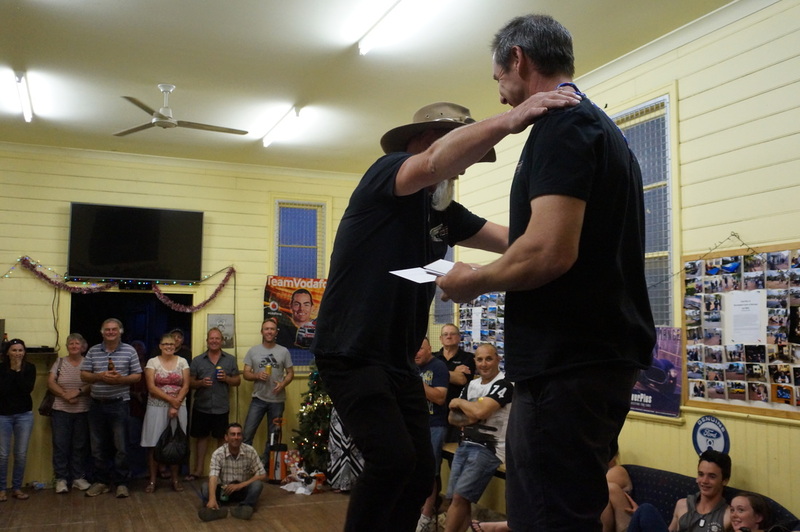 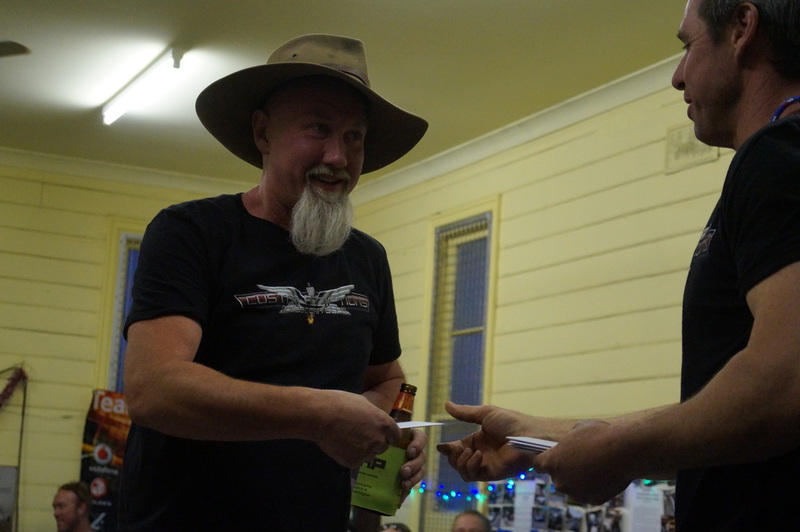 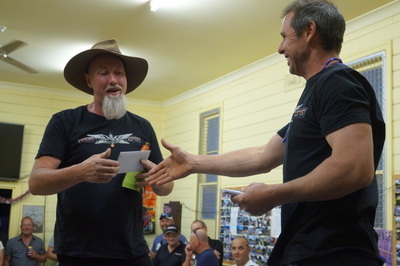 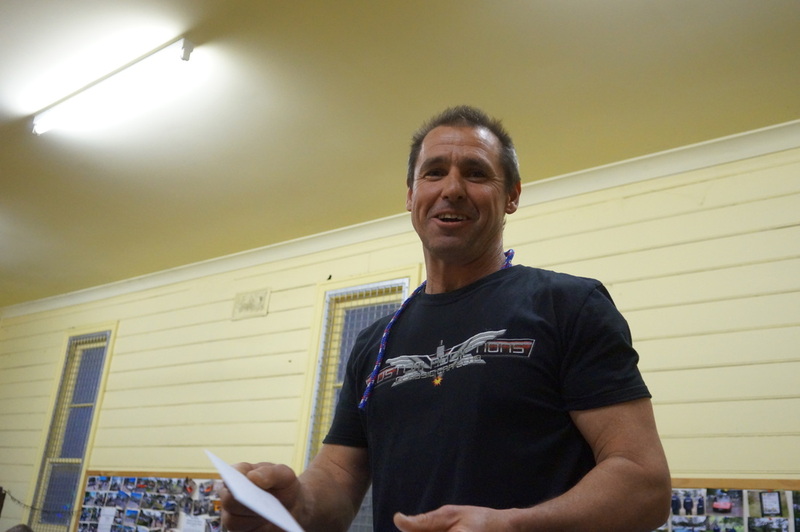 Kim awarded quite a few other members gift vouchers too, as a 'Thank you' for the contributions you make to the Club - Brett, Hoota, Wayne, Darren, Matt, Mick and Glenn. 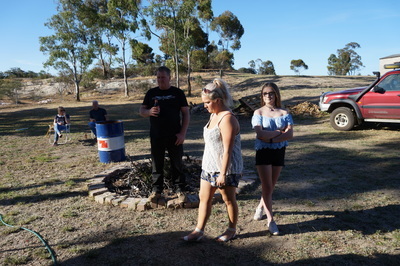 Thanks Kim. It probably wasn’t the alcohol, and I don’t think the pizza’s caused it, but our Prez seemed exhausted from a hard day’s work and attempted to crawl into his 4WD for a sleep around midnight. 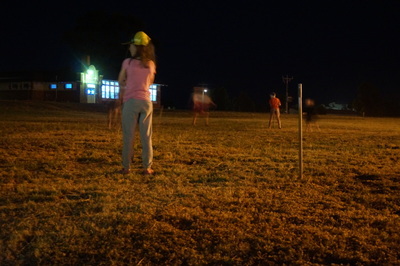 Mistake. 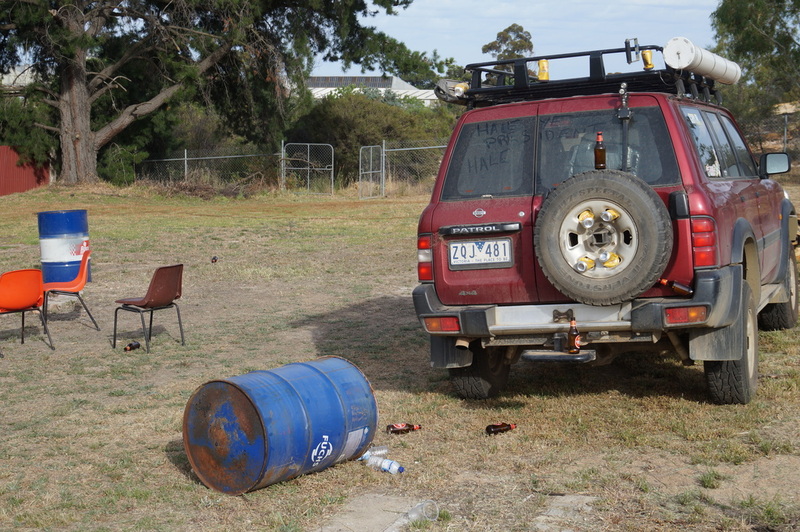 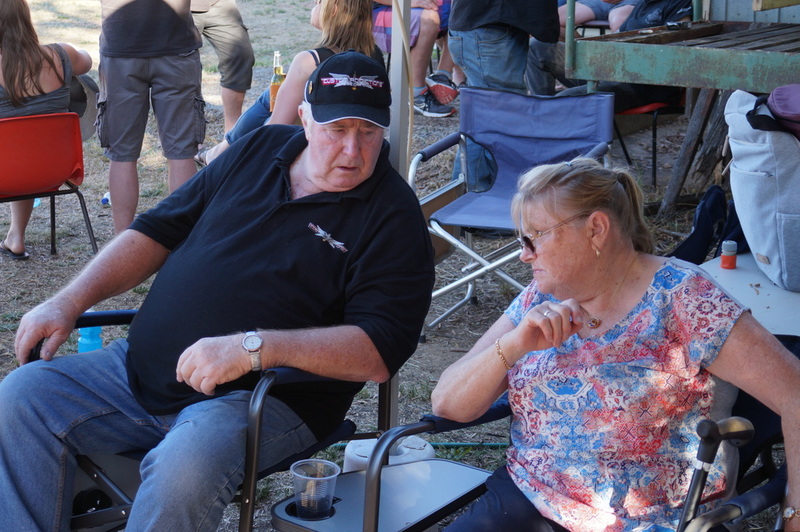 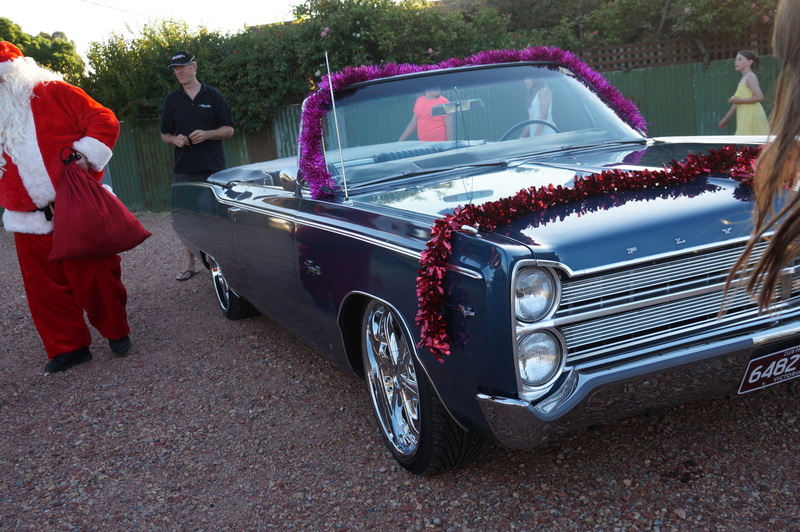 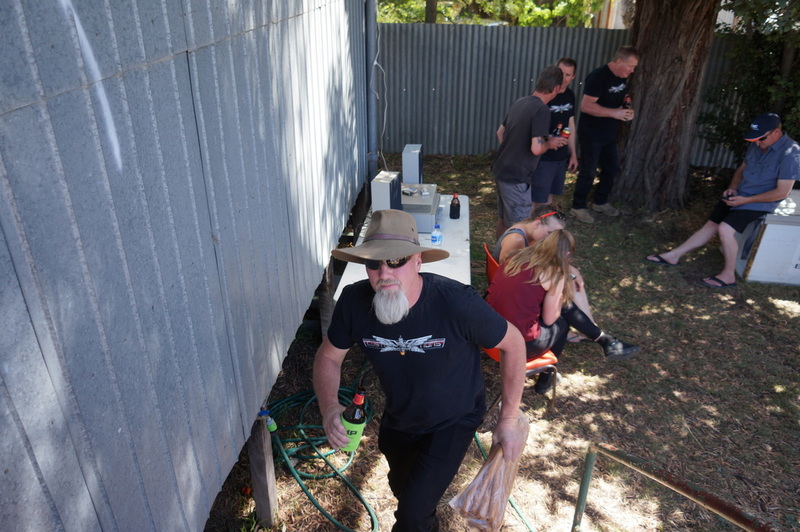 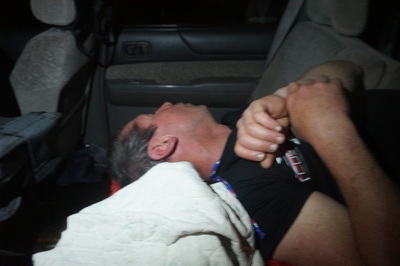 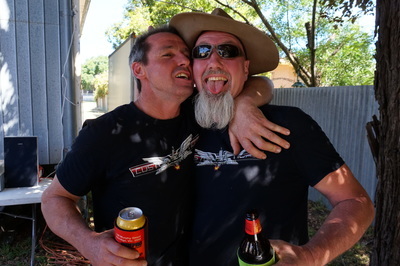 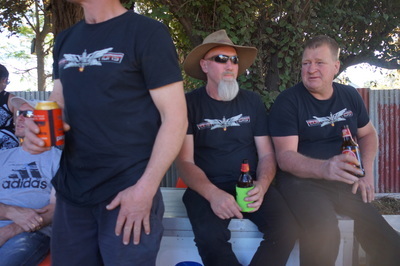 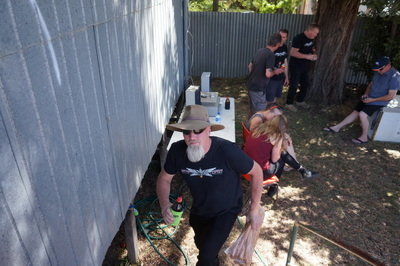 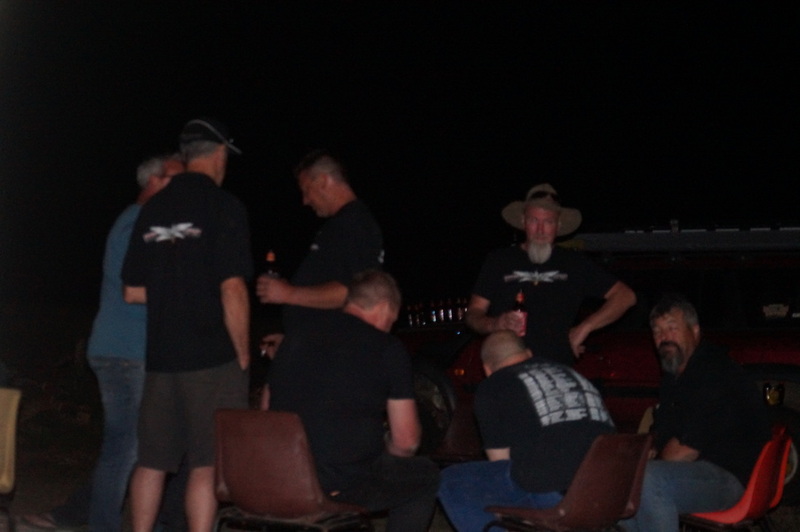 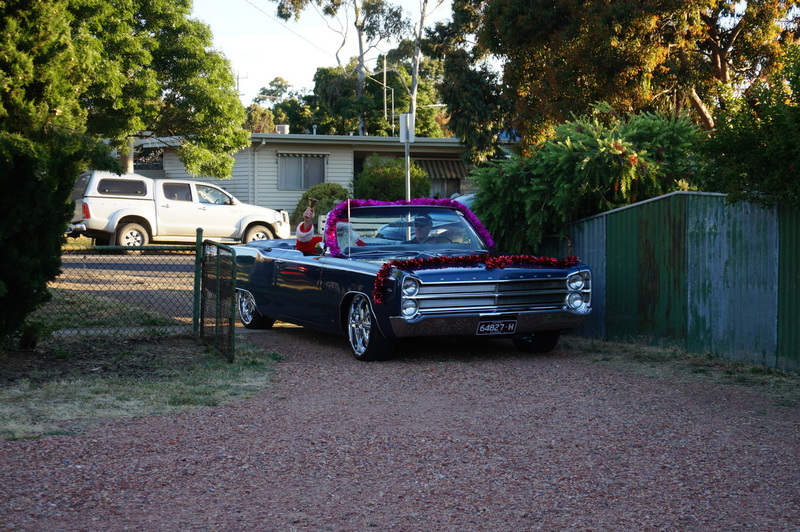 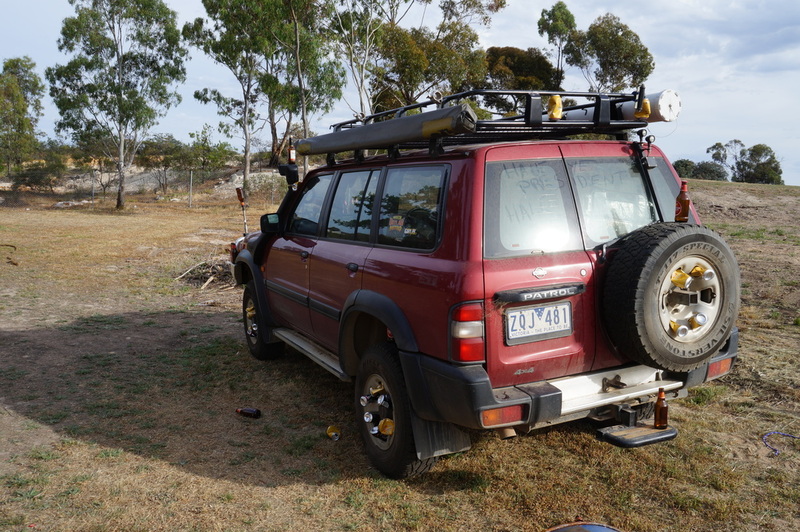 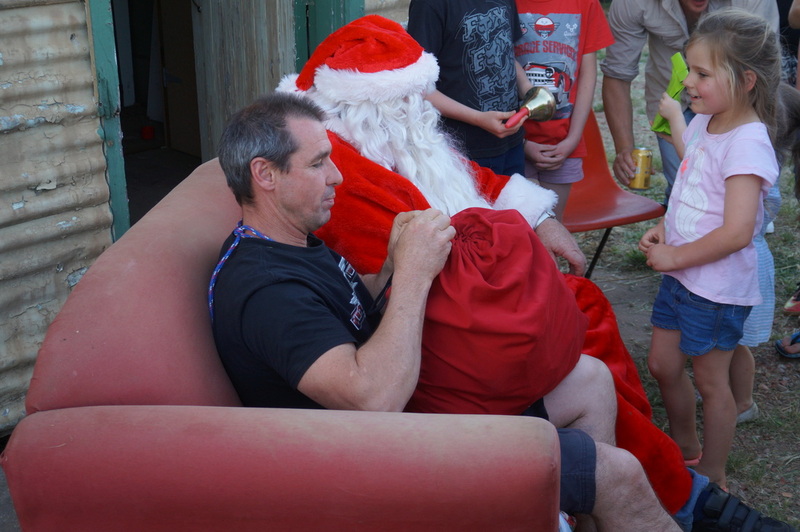 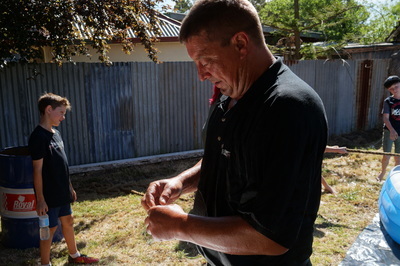 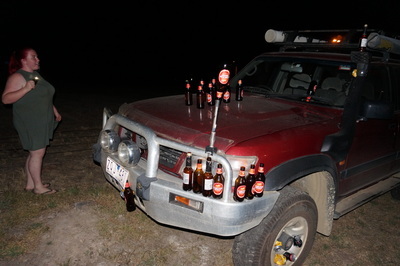 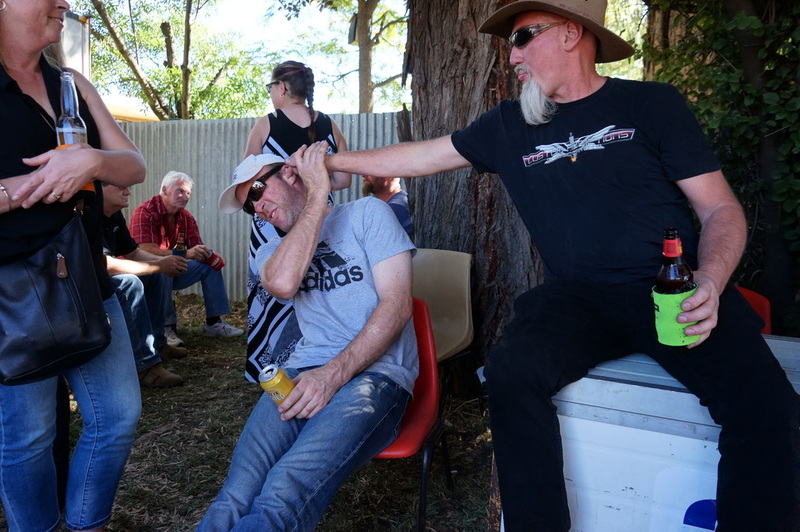 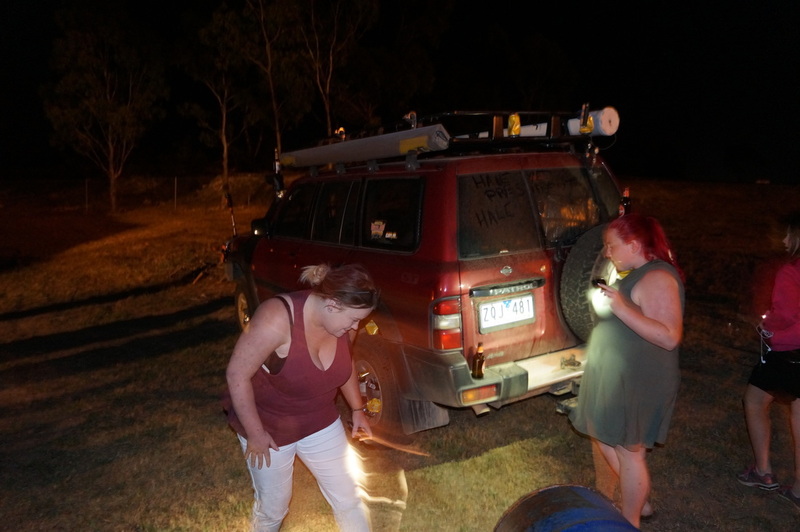 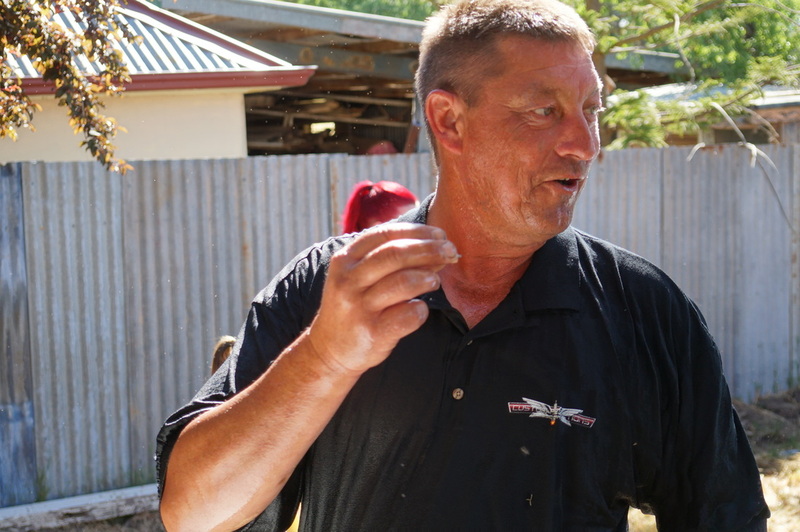 One of our members - can’t name him (has a cool beard and wears a wide brim aussie hat) – couldn’t help himself and just had to round up all the kids and let them loose on decorating Kim’s Landcruiser while he was unconscious - aahh - sleeping. Once again checkout the pics. 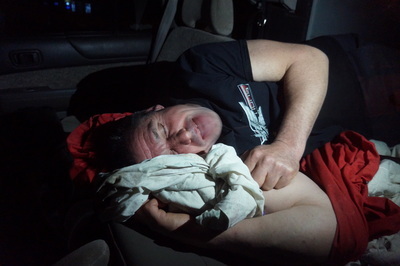 Lesson - don’t ever go to sleep while there are other people around. 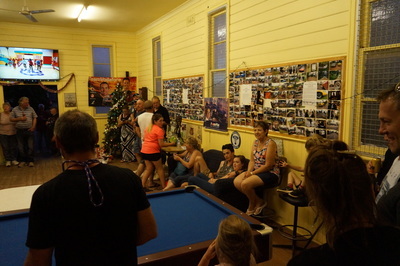 Merry Christmas all - See ya next year!